I’ve been hip deep in other matters this week, but I wanted to be sure I upheld my promise to show something cool this week. 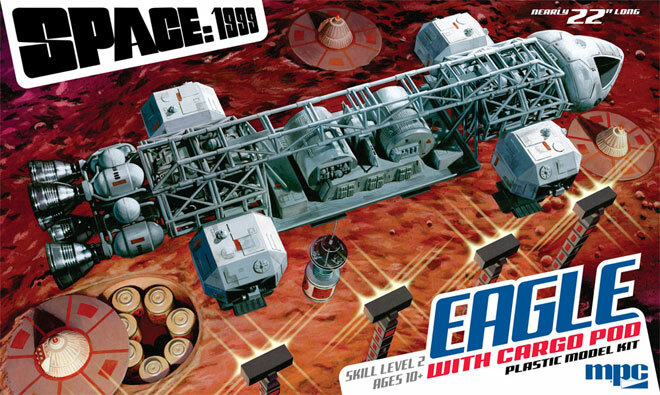 You could skip to the bottom of the post if you want another clue about “what’s in the box,” but you’ll miss a closer look at our new 1:72scale Space:1999 Hawk kit box art and test shots! 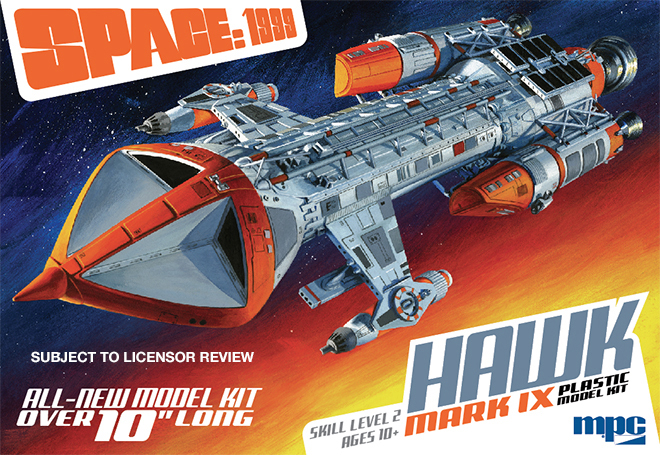 Here is a full view of the Hawk box illustration followed by a closer look at the ship and the illustration placed in the context of our box face layout. 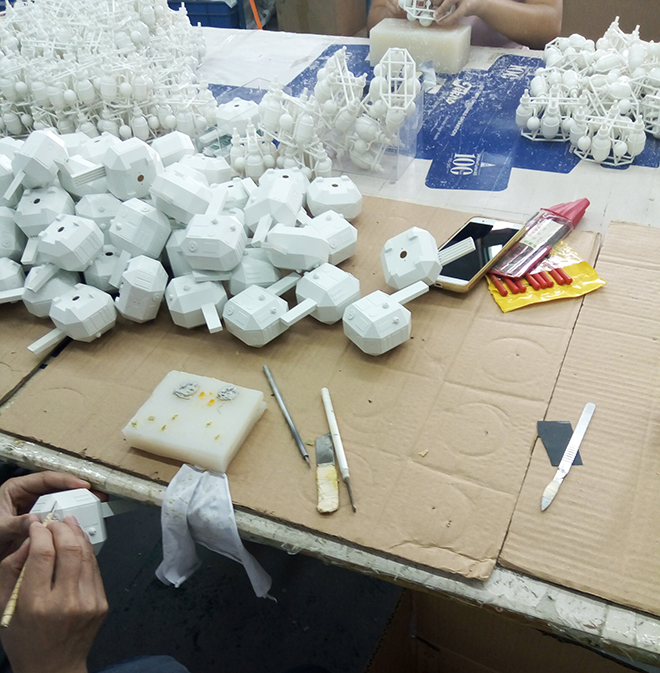 The rest of the packaging is still underway. As with all first test shots, this one DOES have some problems that will get worked out before release. The most noticeable problems are sink marks due to the injection machine not being fully primed for injection. Additionally, there are fit problems with some of the locator pins. Some parts appear to be bent, but straightened out during assembly. 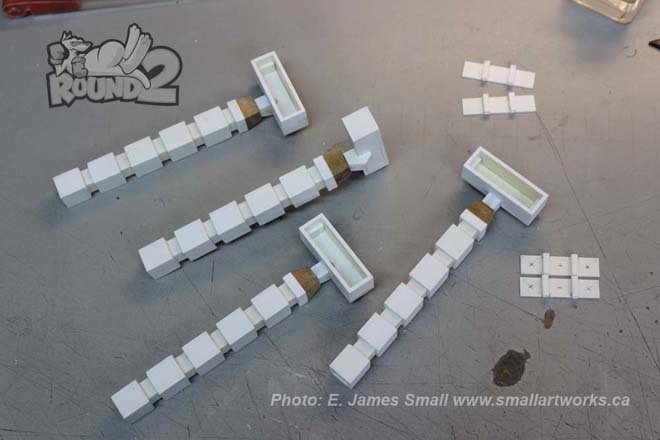 Here is a look at the full sprue followed by various looks at the assembled test shot. Don’t mind the mess. 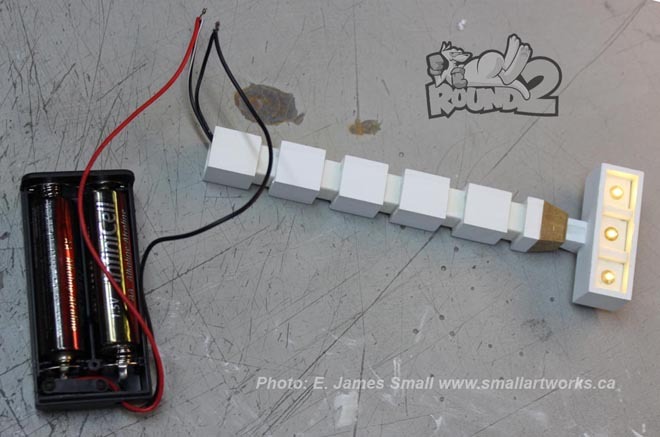 These builds are usually hastily assembled glue bombs. Photos of our publicity buildup will be available soon. 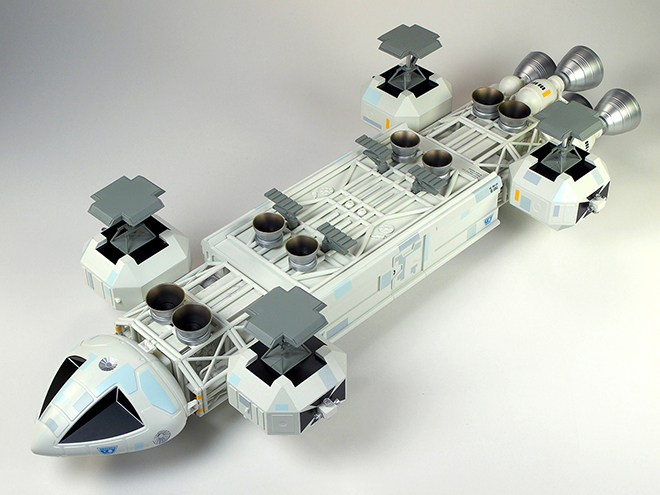 It has been no hidden fact that we have been considering other scales to use for our line of Space:1999 model kits. Kits in a new smaller scale will allow us to shoot for the same accuracy we always pursue, but let’s us bring kits to market at a lower price point. 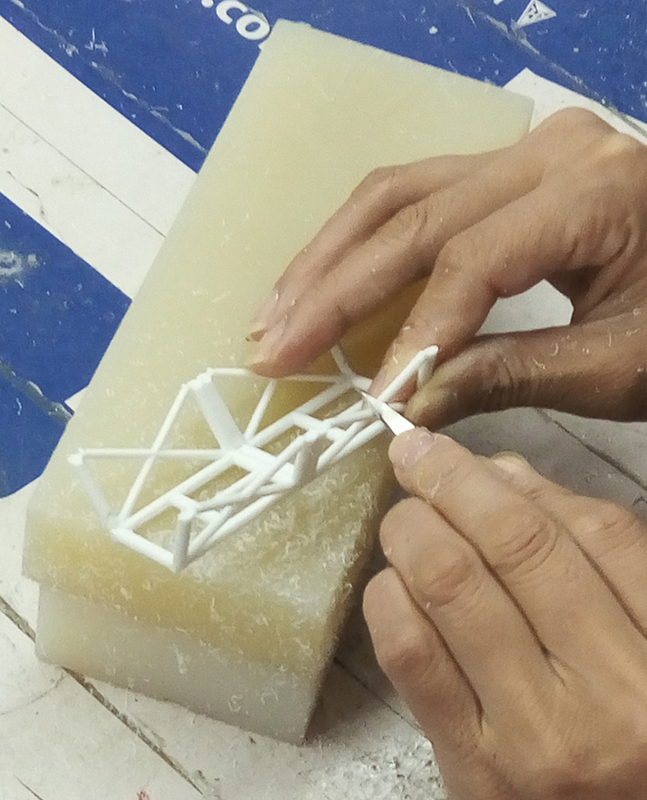 It allows our tooling consideration to go further. 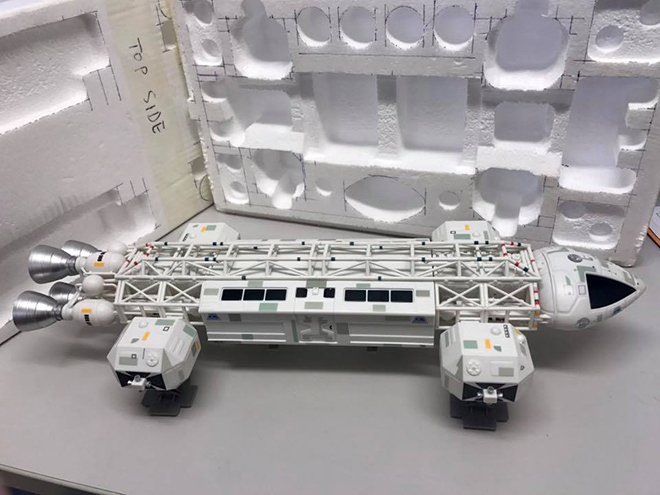 Instead of one big kit every couple of years, we can bring out a series of kits in the same scale just like we do with our line of 1:1000 Star Trek kits. 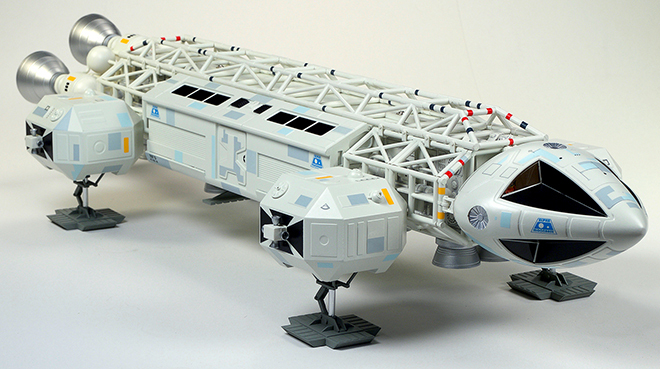 So if 1/48 is too big to keep up the pace, what scale would be acceptable for these ships. This question was recently posed to a Space:1999 facebook group to get the answer straight form the consumer. 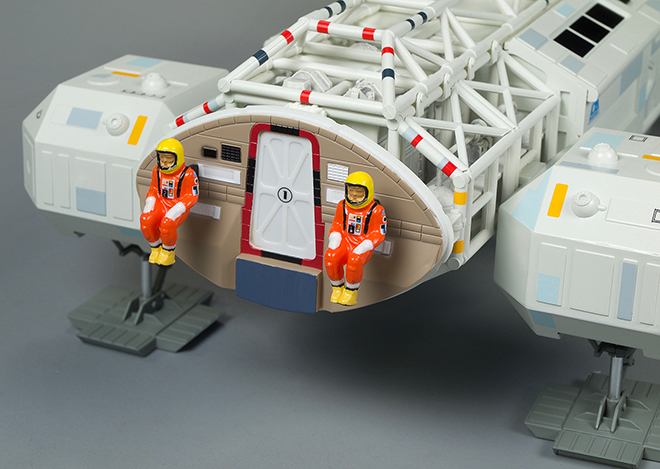 The overwhelming favorite was 1/72 scale. At this scale an Eagle comes out to about 14 ½” long. 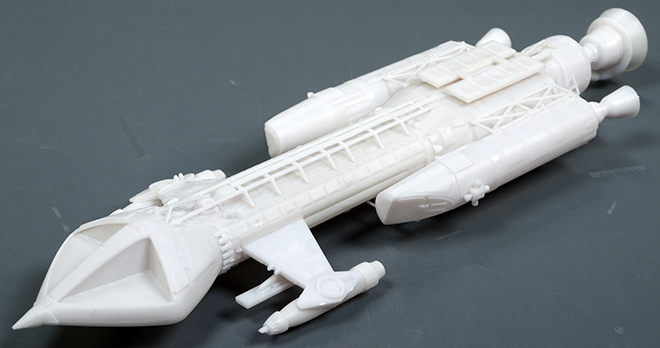 Landing at 2 ½” longer than the old MPC kit, that should give us a enough room to work and get plenty of detail. 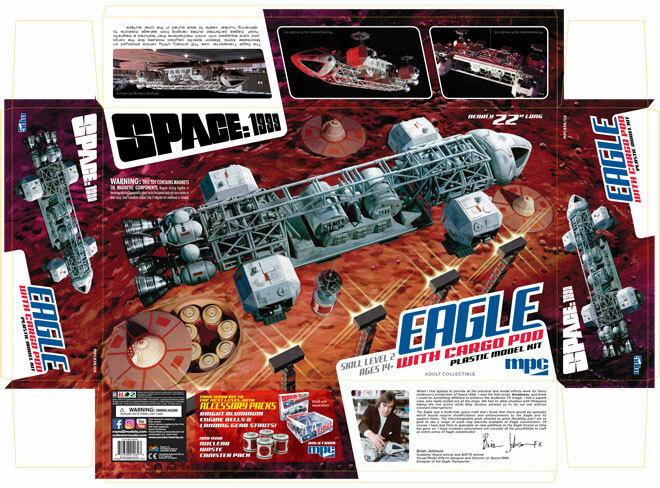 But, why do another Eagle right away when the last Space:1999 ship we created was an Eagle. So, we decided to take a step in this scale with a Hawk instead! 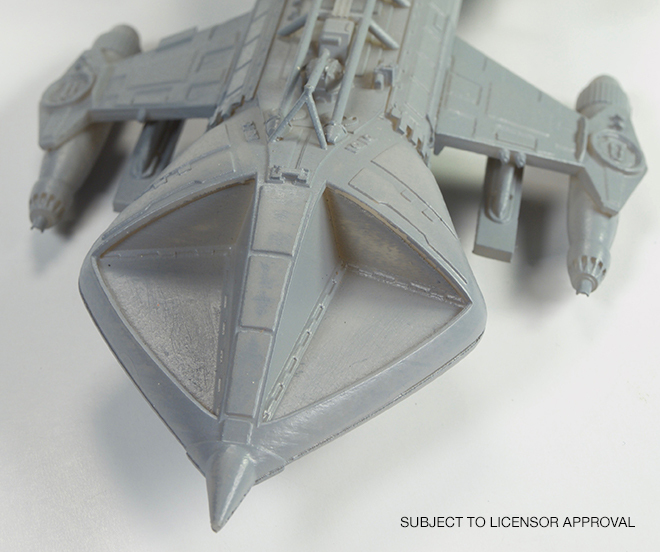 By no fault of its own, our new 1/72 Hawk kit will land at about the same size as the old MPC/Airfix kit. But don’t worry. 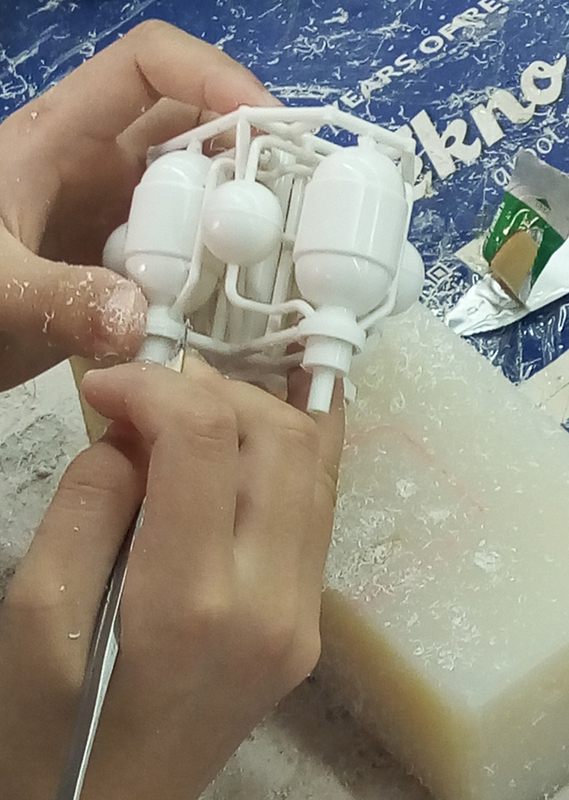 We are ignoring that old inaccurate kit and starting from scratch. 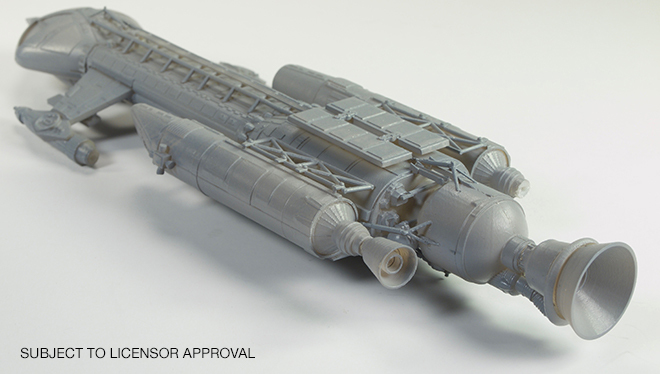 Our new model will be as close as we can manage in injected styrene to match the original filming miniature. 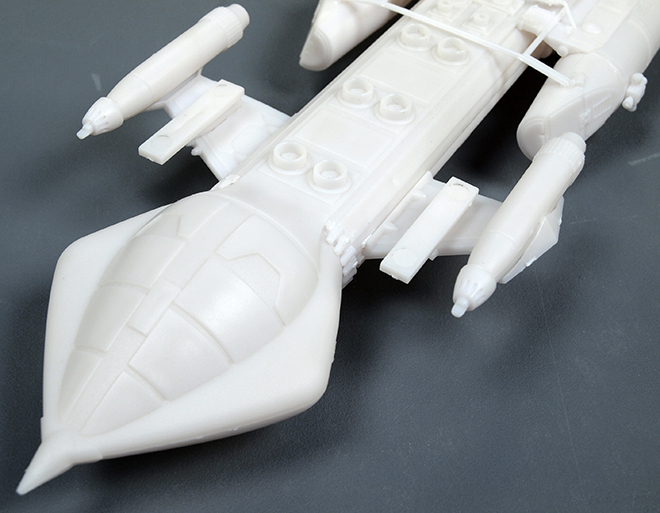 So here for the first time, we are showing the progress on the kit thus far. We are shooting on a May release. So look for it at Wonderfest 2018. 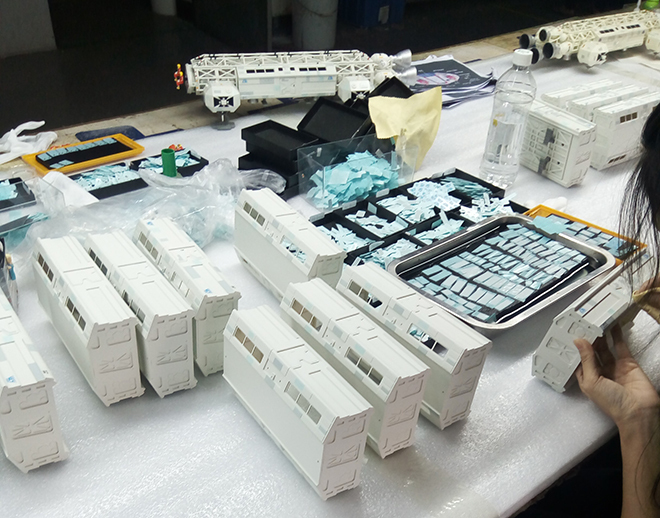 We had sent the first factory deco sample to Alpha 2017, a Space:1999 fan event, to get feedback on it to check ourselves. 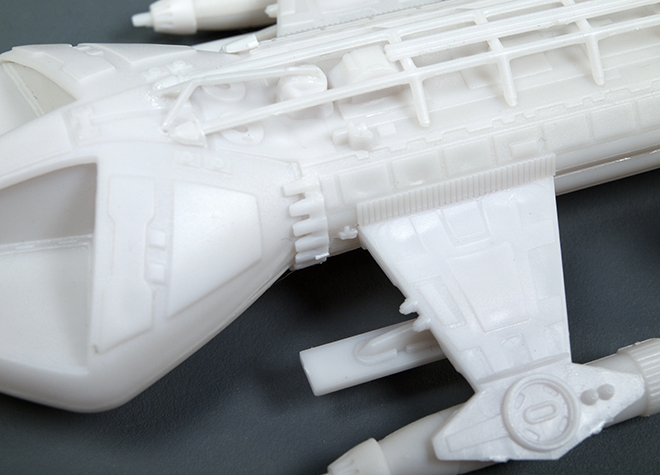 We knew the deco needed a color adjustment, but we wanted to know how plain injected ABS plastic would go over. Here is a side by side with another Eagle from the Todd Morton collection. 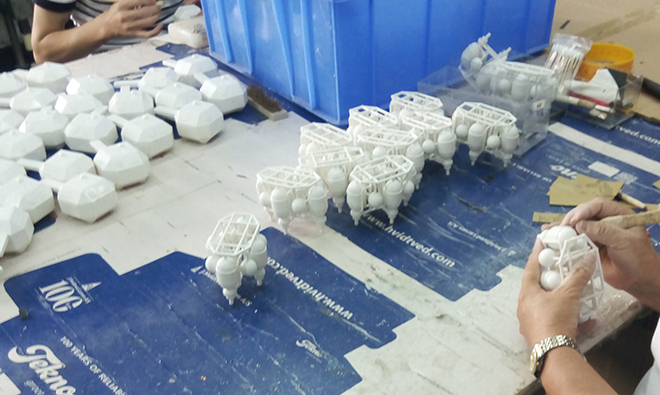 We took heed of the feedback many offered that the product looked too toy-like and opted to apply a base coat of paint to it and we added a weathering treatment to boxes inside the cages at that point. We all agree we ended up with a much better result. 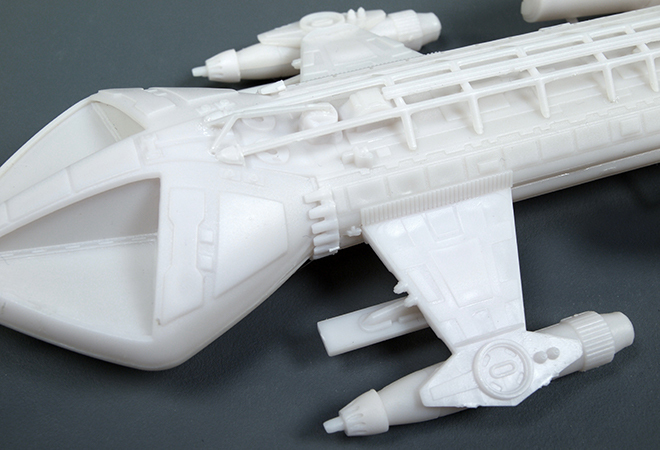 Here are a couple close up pics of the ABS plastic. 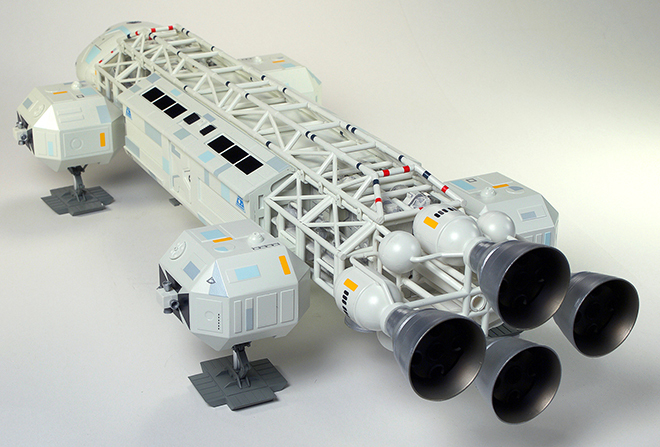 Although the model is –mostly- pre-assembled and it is completely decorated. 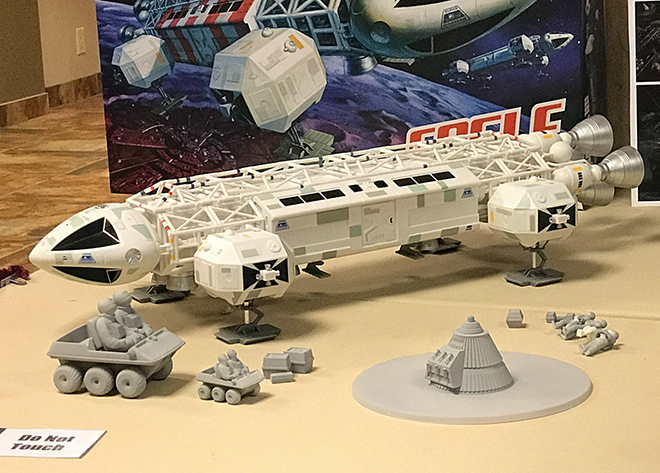 The deco look is a relatively clean looking Eagle reminiscent of mid-season one appearance of the filming miniature. 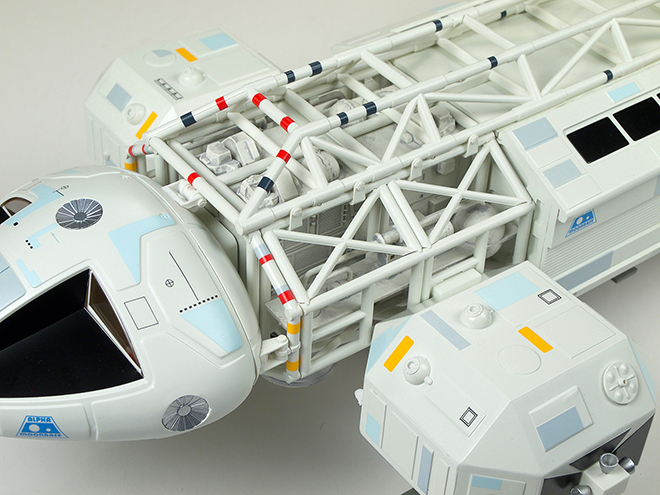 All of the logos and technical markings are present as is a modest amount of surface paneling and the weathering on the boxes inside the cages. Engine bells come unattached. 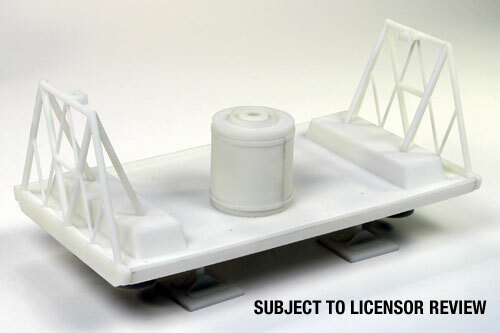 This was done so that collectors could opt to upgrade to the aluminum engine bells included in our Deluxe Accessory Set. The nose cone cap is also left off to show the pilots and rear cockpit wall. Just like the kit, the landing gear are spring loaded for an authentic feel. Suggested retail price of the model is $300, but that varies greatly between retailers. Some may feel this is too much, but we can assure you we have done everything we can to keep the cost as low as possible to satisfy as many collectors as we can. 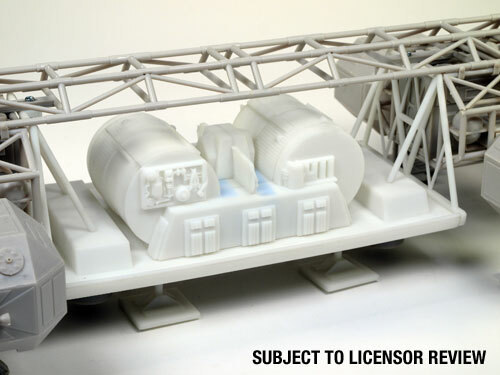 The product is meant to appeal to non-modelers. 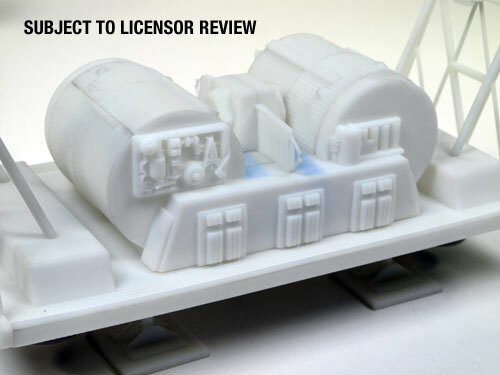 We know what our usual modeler can do quality-wise, and achieving that level of finish is worth every penny a contract builder would charge, but I doubt you will find a contractor to build a kit with an all-in price that competes with our price point. 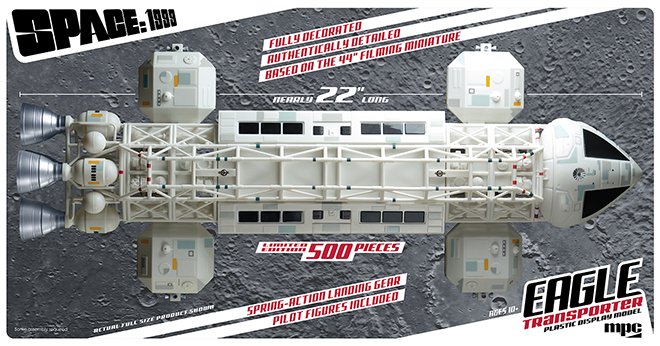 To get a decent grasp on the demand of the market, we have decided to limit this release to 500 pieces. We will use the reaction to the product to judge whether to offer another version later down the road. This just in… photos of the production. Assembly and hand cleaning seams. 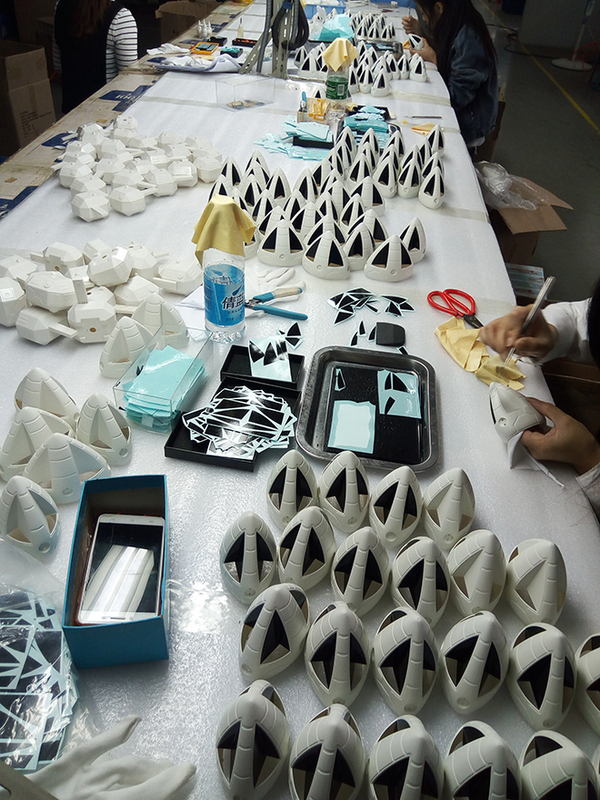 Hand applying all of the decals. Nothing is pad-printed. (UPDATE #2) Check out this promo video! 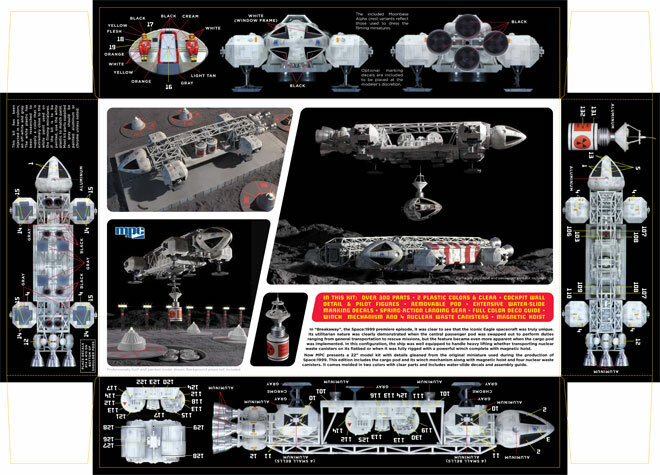 Space:1999 effects supervisor and model designer Brian Johnson has always been very complimentary of our work on Space:1999 kits. In fact, we make a point to put a statement of endorsement from him on our kits whenever possible. Unfortunately, in the case of the Nuclear Waste Area 2 set, I waited until the last minute before sending a request for a statement from him. I didn’t want to make his effort go to waste though… (wow, pun much?) 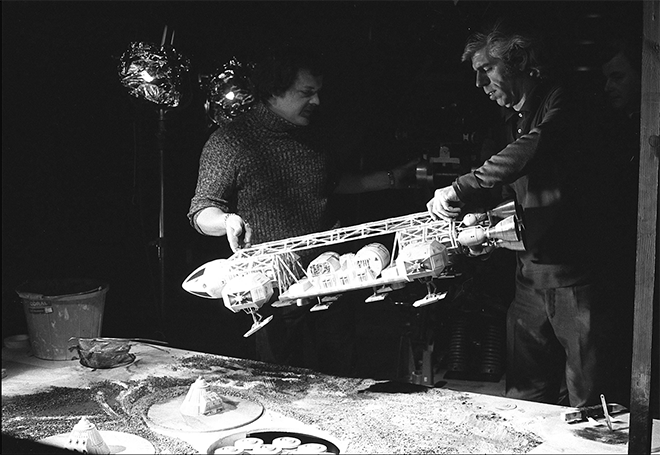 So I’ll post his kind words here and show a few behind the scenes images of Brian and his crew at work on the scene from the show that inspired this set. 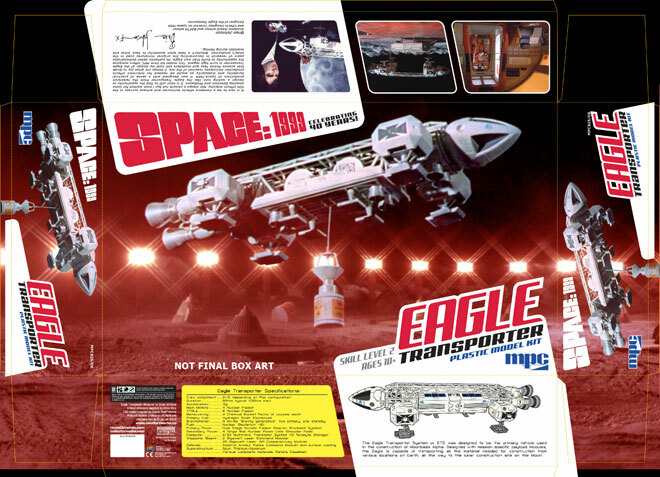 As described in previous posts, I enlisted Jim Small to assist with the new Space:1999 Eagle with Cargo Pod box illustration by having him build some environmental props shown in the nuclear waste storage fields in Space:1999. So with all that work done, it was time to start photographing everything in context which could then be used as reference for the illustration. 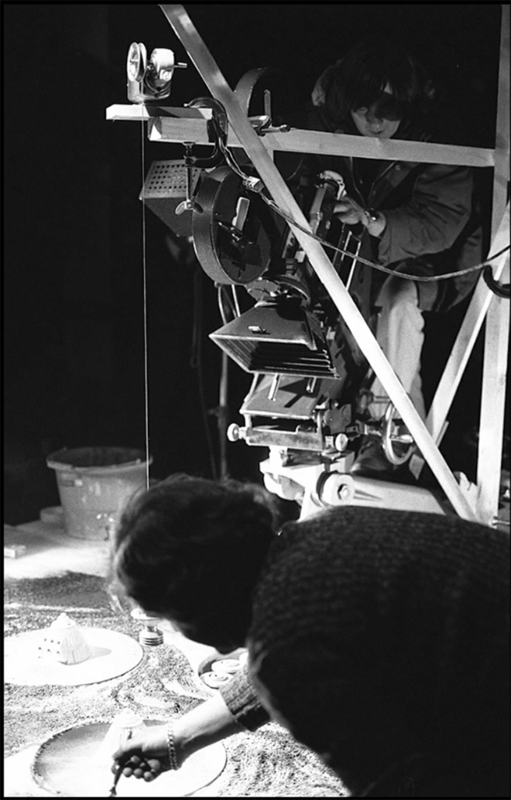 Our method of working through this is kind of like a director working with his director of photography in a film, but we work long distance and transfer images and direction via chat messaging. Jim has everything set up in his workspace and sends over a photo. I usually plug that into my box layout that already holds all of the other design elements. Then I send direction back to him. Is the angle alright? Is the lighting correct? Etc. is worked through. In this instance, Jim sent me one quick photo just to generally set stuff up and see how the angle works, and this was the initial shot. The angle was fine, but I had him play around a little bit with the location of the storage silo, but ultimately landed on the decision to position it below the rear of the Eagle. Once that was settled, we moved on to the other elements. 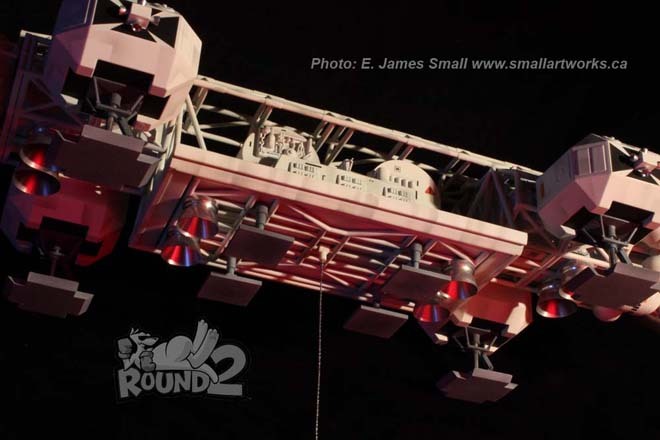 I had him adjust the lighting and position the nuke cone platforms to the space I had built into my design. My initial vision was to have a row of lamp stands in the foreground, but I thought we would be missing out on seeing the signature light flares coming off of them in that position. So I had him re-position them to the far side of the scene to judge later. With all of the elements now available to me, I dropped them roughly into photoshop and tweaked positioning where needed and added a photo of the moon surface. This gave me the opportunity to play around with color and to judge where to position the lamps. I ultimately decided to go with my first instinct (because they always tell you to when you can’t decide) and leave the lamps in the foreground. I wanted to use red to pop the box off the shelf, but I am not a “red guy”, and I wasn’t sure to what degree I wanted to push the “red alert” theme I mentioned in my previous post. I continued to play around with color and asked for Jim’s input again. 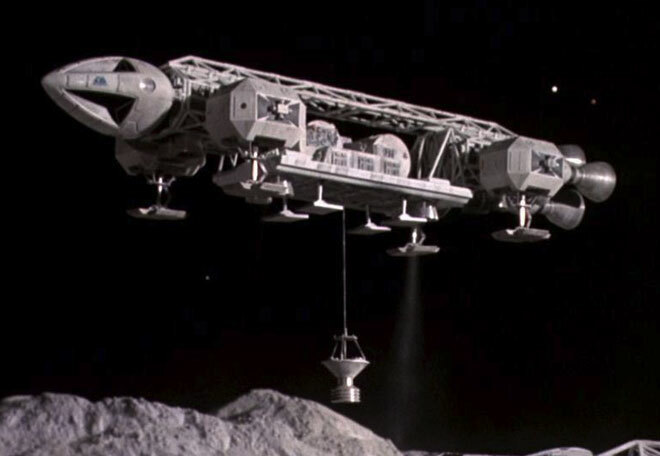 As a purist, he thought it might be better to make the moon surface gray and leave the ship white. The only way to separate them in a painting then would be to make one element “warm” and the other “cool”. I went through the exercise of proving one or the other of us wrong. This is the image I used to base my painting on. The painting itself was painted at 100% print size because the total box area is pretty big to begin with. I learned a lot when doing the first Eagle painting. If you recall, I actually did two paintings the first time around, the large main image and then I painted the smaller background Eagle separately and actually did that one first to get back into practice. I and many other people liked that smaller painting better than the larger main one. 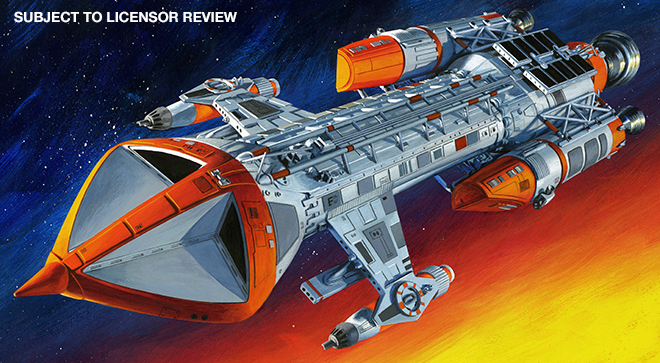 I liked it because I thought the end result was a better interpretation of the ship. (I think others liked it more because it was a longer-distance shot with less distortion in the ship) I think the fact that it was smaller made the paint on the board look more satisfying so I didn’t want the ship to get really big again on the new painting. Besides, working larger (which most illustrators do to allow details to sharpen when printed) would have required a large unruly board to paint on. So it was essentially one half a piece of illustration board measuring in the neighborhood of 20” x 30”. I used acrylic paint again and ended up limiting the number of paint colors with maybe 10 different tubes in the mix. 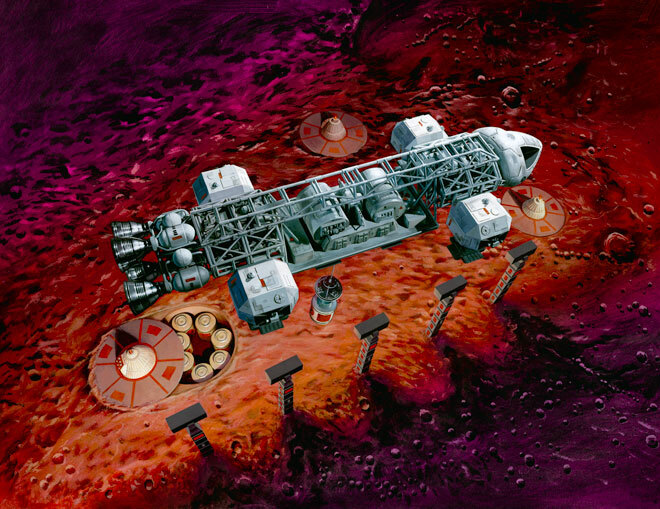 I used cooler reds for the shadow areas of the moon surface and warmed them up under the light of the lamp stands. I started by masking off the ship to preserve it’s pure whites. I then started roughing in the lunar surface before tightening up a few details like the craters, etc. I then moved on to the lamp stands and nuke cone platforms. I tend to paint secondary objects first in order to “keep my juice up” to paint the really exciting stuff like the ship at the end. I only transfer lines for what I intend to paint next. So that means details don’t get drawn in until the overall forms are painted. One of the things I got hung up on with the first big painting was mixing the colors for the facets of the shoulder pods, and ended up painting over them several times. So I started there on this one, and only ended up painting over them a couple times before being satisfied. That helped set the value key for the rest of the ship. I laid in pure blacks just to get me rolling in detail areas. I tinted the whites a little bit where I wanted subtle color tones. In my digital color study, I purposely put a touch of purple in the outlying areas and shifted to a slightly greenish tone in the central area of the cargo pod. This was in hopes of attracting the eye to that area with it clashing against its complimentary background. For no other reason than not knowing where else to go, I started in on painting the details of the ship at the rear and moved my way forward, leaving the spine for last. I was pinched for time by the time I got the painting finished, but it didn’t require the stress of staying up through the night and bringing in a slightly unfinished piece in the end. I had to touch up a few details and add logos and weathering patches digitally to the first painting. 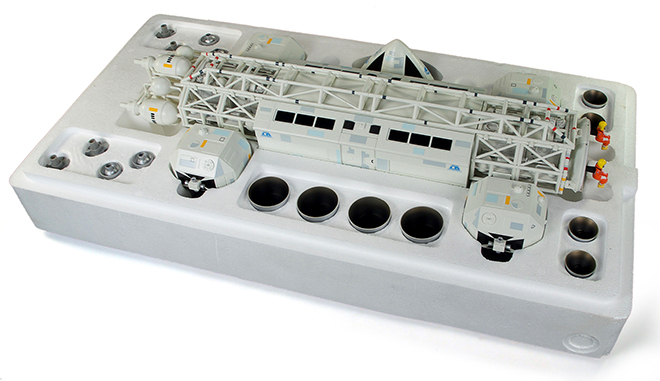 This time around I was able to paint everything in, and realize the fortuitous angle negated the need to paint Moonbase Alpha crests. Scanning and digitally “stitching” a large painting like this is a tedious process even with a ledger-sized scanner. It took a total of 12 scans to capture the entire piece. One set of scans was taken from one direction then, turned and rescanned. 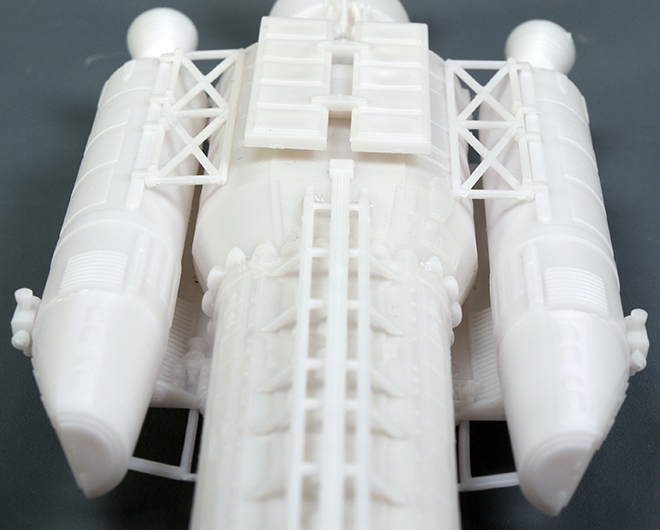 This step helped eliminate the texture of the board and paint that is inherent in the scans. I tweaked the values to nicely match the original painting. 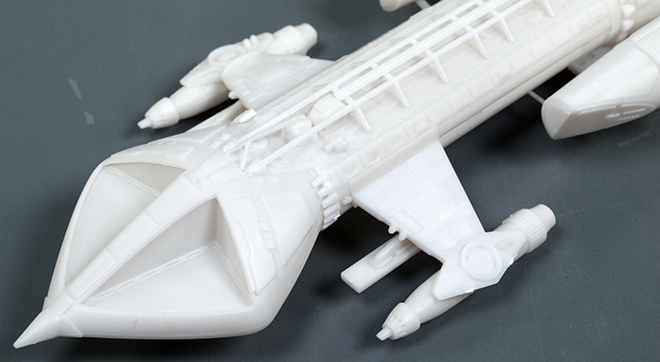 We’ll see how it looks when printed. A cause for concern arose when I showed the painting to Tom Lowe. His first question was “what, is it landed?” Um… Not in my head, and the colors should be tipping off everyone that knows the show that the Eagle is taking away one of the nuke canisters, right? Well, I couldn’t get the comment out of my head, and I had always wondered if I shouldn’t “cheat” and show the lamp light flares even though we never see such flares from behind a light source in reality. I thought adding them was worth giving closer consideration, and this IS an illustration. It should show the ideal, not necessarily reality. the light flares were created in photoshop and I think they really do help to show what is happening as well as stressing that the warm red under the ship is coming from a light source. So, with all that ado out of the way, here is a sneak preview of the entire package layout with the painting and Jim’s buildup photos in place. I didn’t want to spoil this post by putting this at the top. 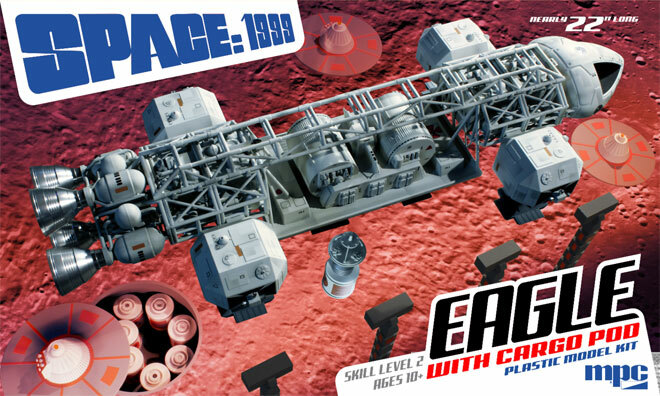 We had announced at every opportunity that the winch boom included in the Cargo Eagle kit would be magnetic, meaning that we would include the magnets in the kit needed to make one of the nuke waste canisters cling to the boom without requiring glue. Well, it would have been nice… We have been advised that in order to prevent the possibility of child endangerment, we should not include the magnets in the kit under any circumstances. The kit is engineered with locators for the magnets in case anyone wants to procure their own. In lieu of the magnets, we added a peg to the boom that can be easily removed for the sake of accuracy. Was this an over reaction? Probably, but we couldn’t risk the liability. 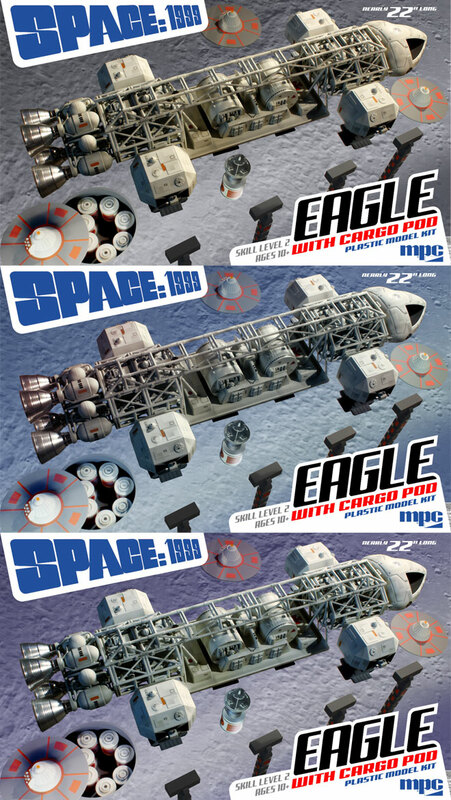 As part 2 of our look into the packaging for the new MPC Eagle with Cargo Pod model kit, we have a special article written by Jim Small. 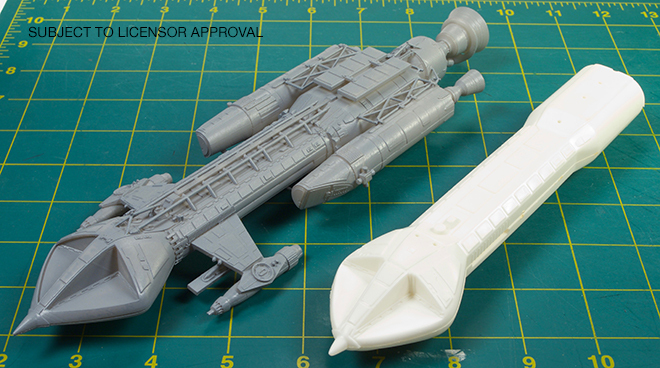 Jim is our go-to guy for all of our sci-fi model kit buildup work. 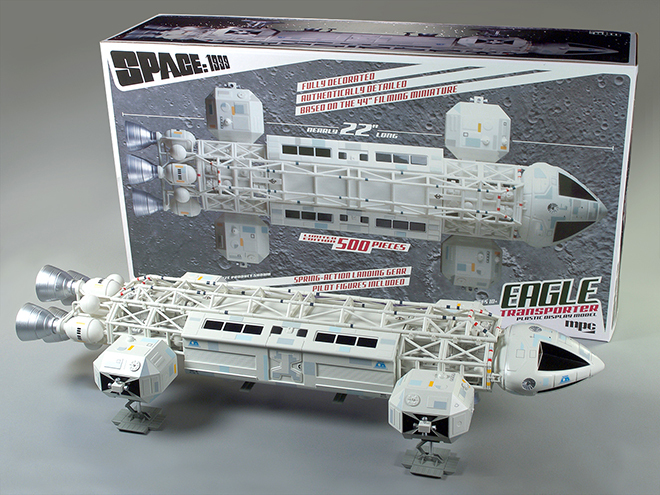 He also supplies endless consulting on all of our sci-fi kits and especially everything Space:1999 related. 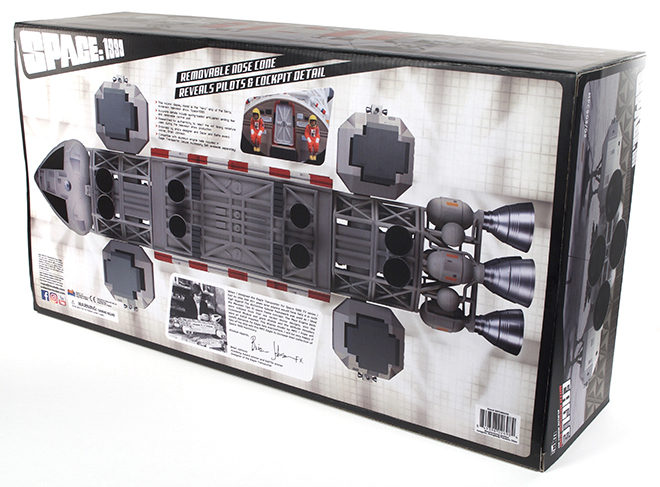 In our last blog post, I mentioned that I had him on the hook to do a little scratch-building/heavily altering a set of Eagle nose cone parts to show a wrecked nose cone for the box bottom and a few stand-in mockup parts that could be used for reference for the box illustration. You’ll find, as you read, that Jim really went above and beyond what I asked for. My kudos and many thanks to him for that! Special Box Art Effects, One Shot at a Time. 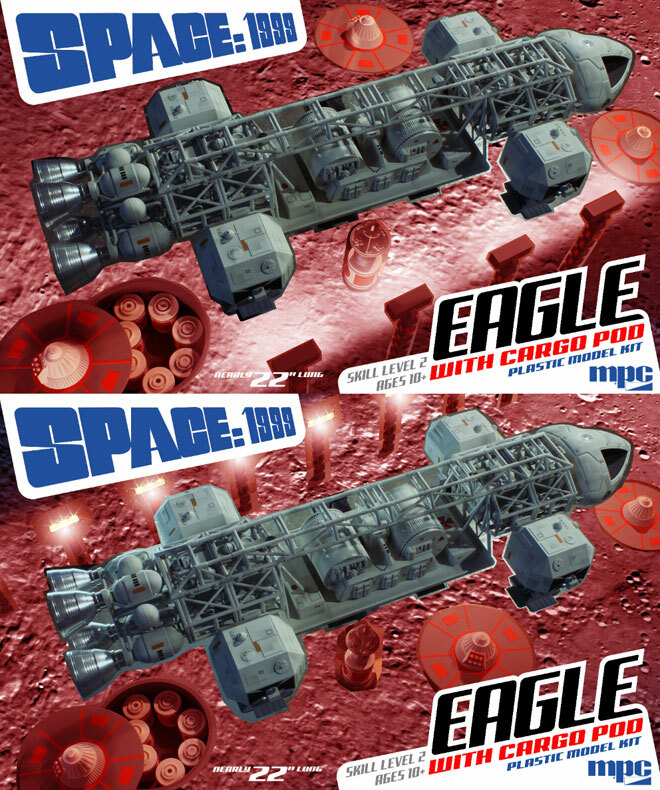 The newest release in Round 2/MPC’s fantastic Space: 1999 lineup is the Cargo Eagle with Winch Pod. 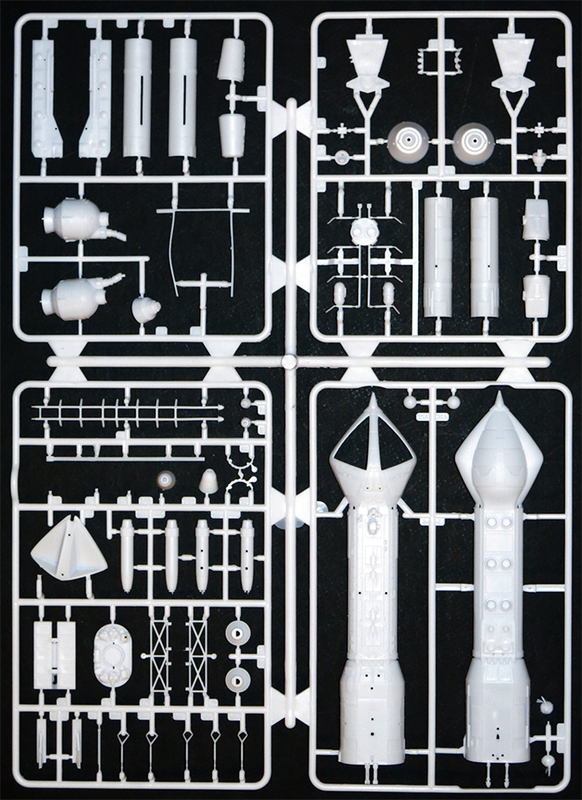 As with every great kit, there needs to be great packaging. The work prepared for the box cover needs to be engaging and authentic to satisfy discerning fans today. 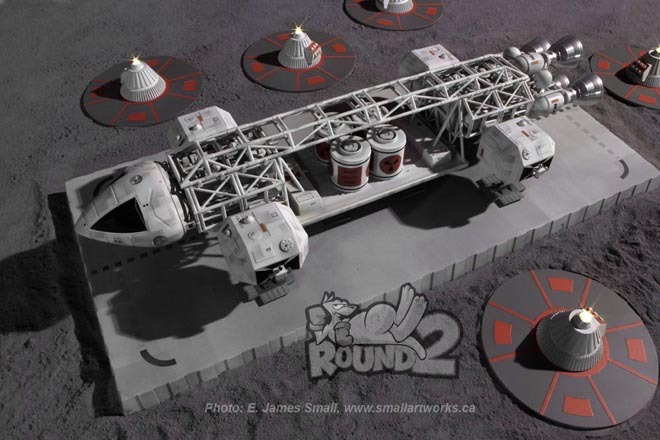 Jamie Hood, Round 2’s senior designer, product development expert and resident Sci Fi artist is, as usual, right on top of his game with the soon to be revealed new boxtop design showing the iconic Moonbase Alpha workhorse in the fantasy situation as seen in the opening episode, “Breakaway”! Although another one of Jamie’s gorgeous hand painted illustrations will grace the main box cover, he needed some model photography to flesh out the box bottom and sides to show off how great this kit is, and he asked me to help produce some of that work. 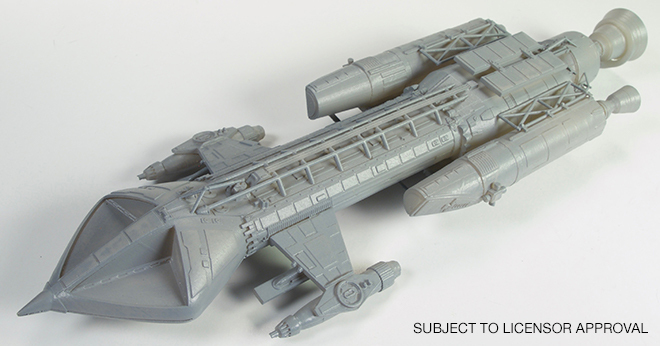 I had been supplied test shots of the new Cargo Pod and accessories which I built, finished and used in conjunction with an existing Eagle model I had previously built. Jamie knows how much I love to photograph models in a dramatic fashion, so he asked me to try and recreate some original scenes from the show using the actual built and painted kit. Jamie started by showing me some screen grabs of the scenes he wanted to recreate. 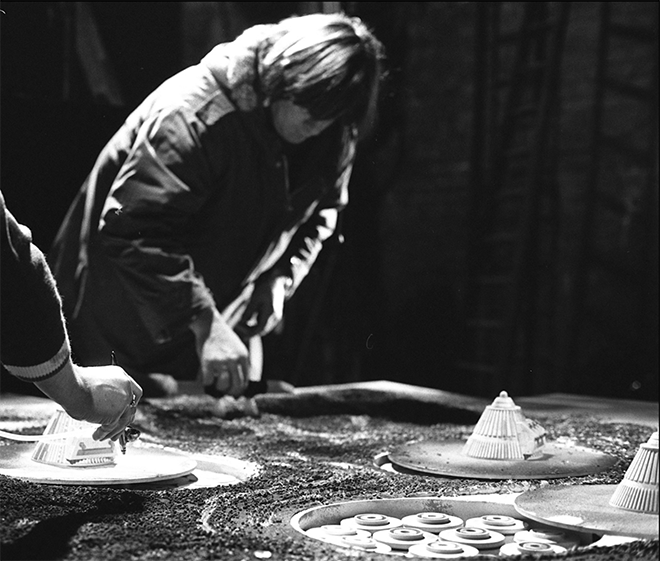 Because of the predetermined photographic layout Jamie had provided, I knew that some of the pictures had to be choreographed somewhat differently than the screen grabs to accommodate the spread. 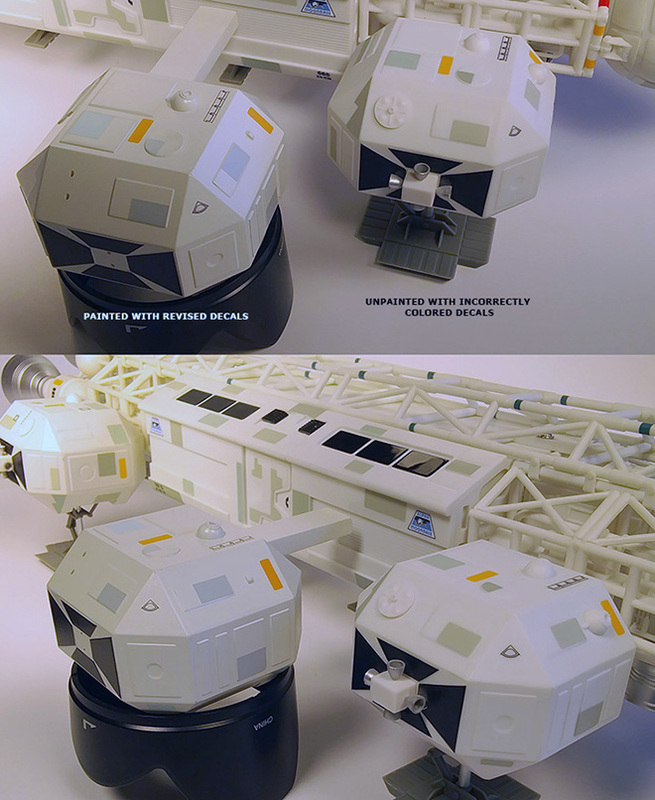 Two models made using test shots of the new Cargo pod and accessories, one painted, the other left unpainted but decaled to show how great the kit can look even without any painting at all! 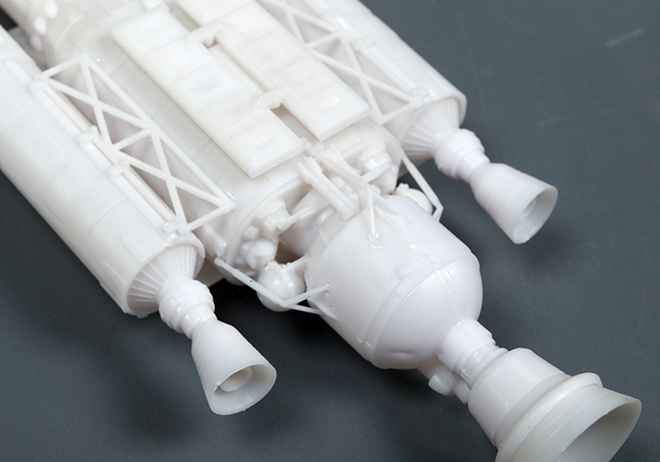 The special machined aluminum accessory sets are also attached to the models. Normally I like to do all my photography completely “in camera” with no digital effects, but in this case because of the limited space in my shop and the expanse of the scenes needed I had to cheat and use Photoshop to assemble the various elements that had to be shot to create the visuals. Also, one of the shots needed to have three Eagles in the picture, but I only had one finished model at my disposal at the time so I had to do some digital manipulation. 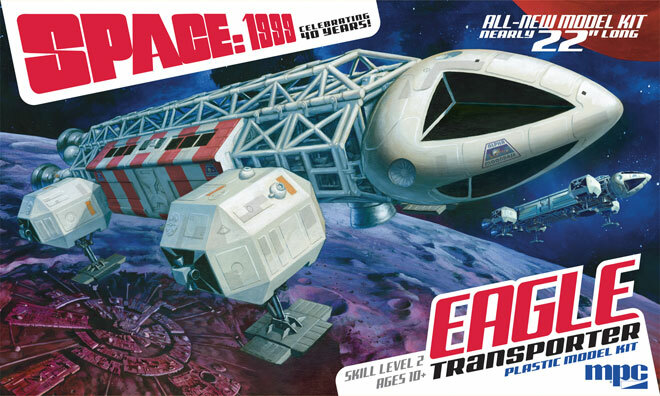 The picture would also show the red striped Rescue Eagle, but I had only a finished plain white passenger pod available which was earmarked for a customer so I couldn’t paint it. Jamie would later add the red stripes in digitally. 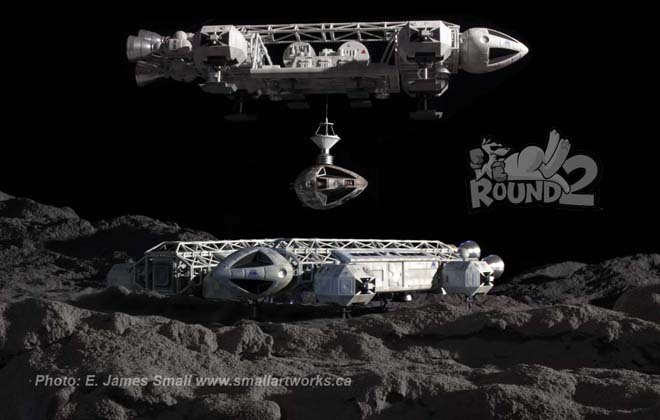 I also needed to scratch build some props not included in the kit to make the scenes required for the box art so I built some quick-and-dirty replicas to scale with the 22” model to provide the necessary backdrop. 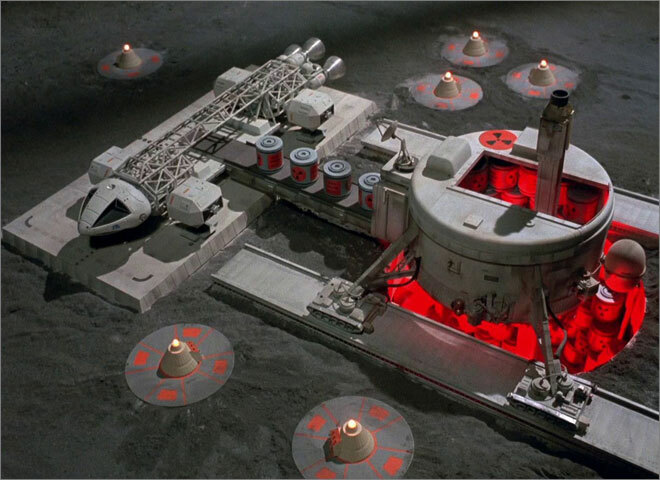 I made correctly scaled light stands, a simple rectangular landing pad matching the original, a nuclear waste disposal area cone and a “pit” that contained the canisters which matched what was seen in “Breakaway”. 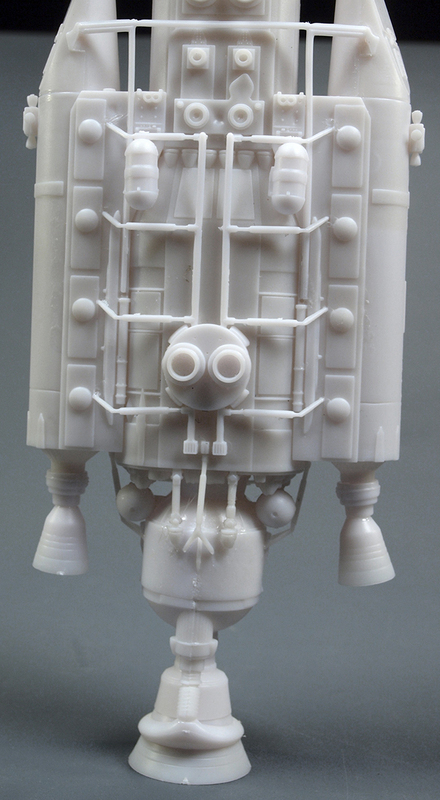 Jamie also liked the idea of showing the Eagle carrying away the damaged nosecone as seen in the episode “Missing Link”, so he sent me a spare nosecone from his parts bin which I re-worked to simulate the banged-up cockpit section. 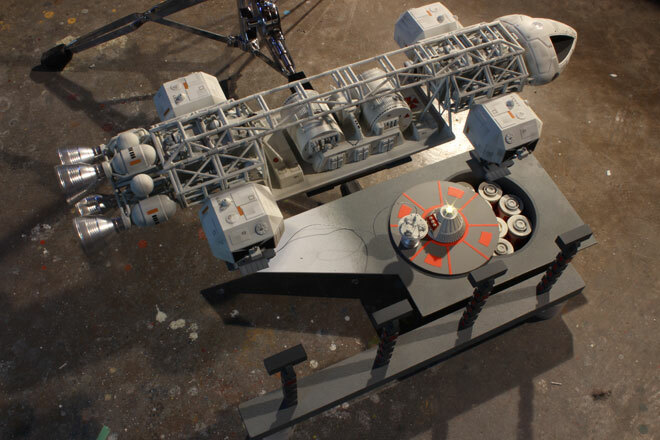 Making the props was a LOT of fun for me as I do love to scratch build and modify stuff. 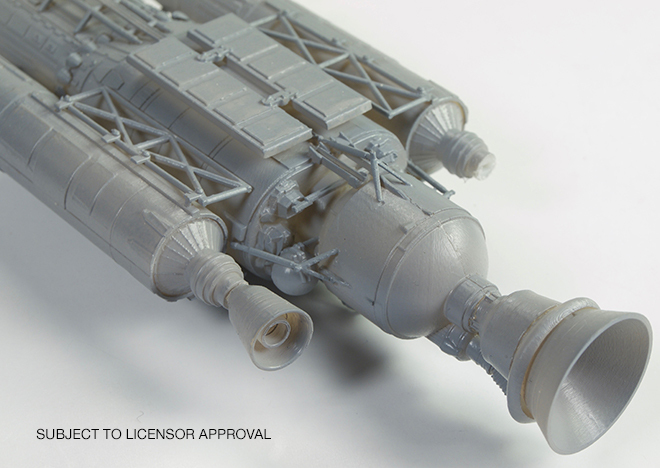 It gives me some real creative license as well as the challenge of reproducing the original models used in the show from scratch. Time was limited so in true traditional VFX style I built everything with just the photography in mind. 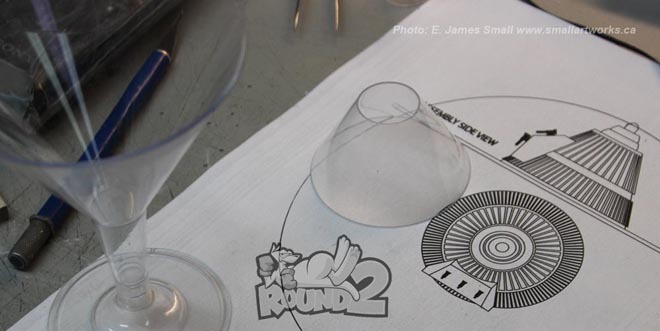 The waste area cone, for example, was made from a disposable plastic martini style cup and detailed to suit. 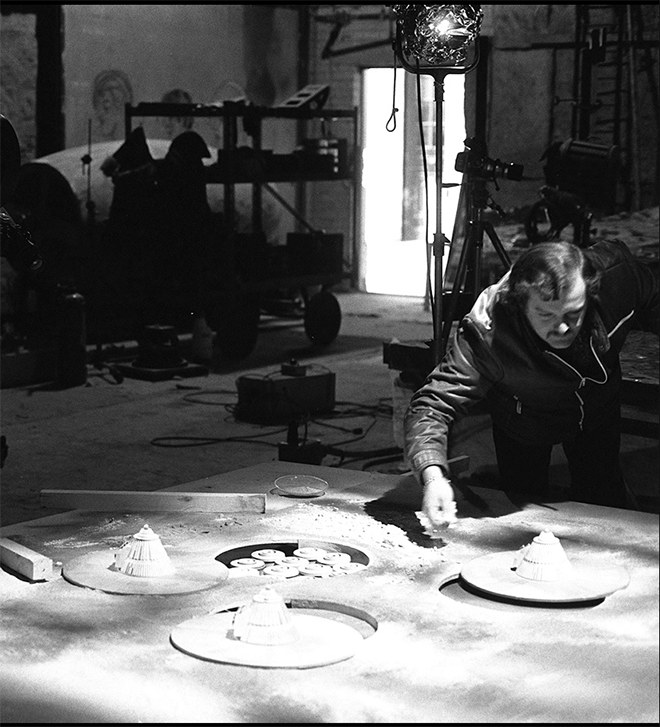 The “nuke dome” being started, the cone cut from a plastic martini glass of the type seen at left which coincidentally has the close-enough-to-work angled sides. 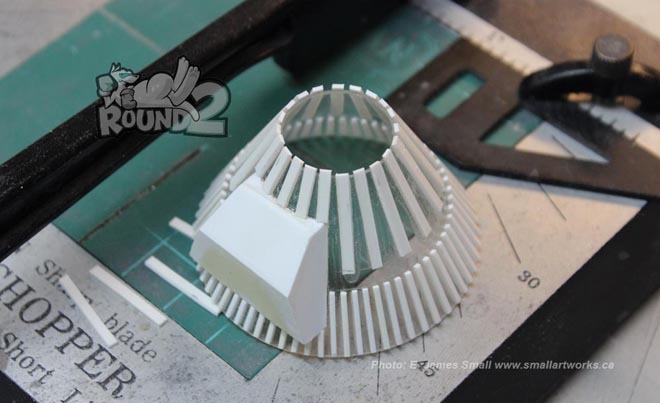 Details added to the cone using sheet and strip styrene. 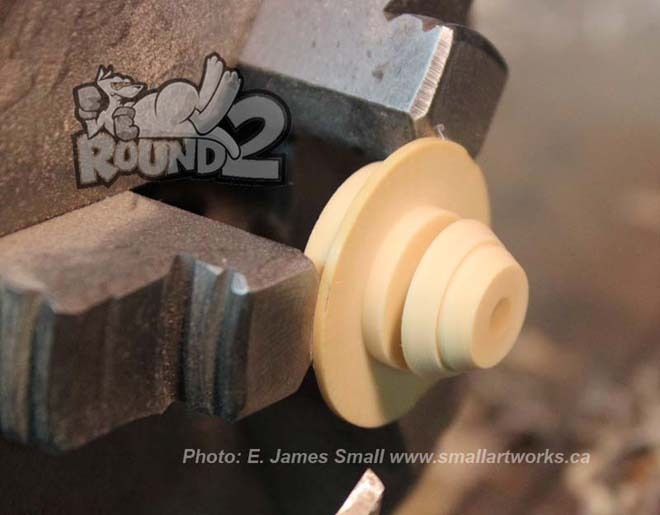 The top of the cone is turned on a lathe from a piece of leftover resin from another project. 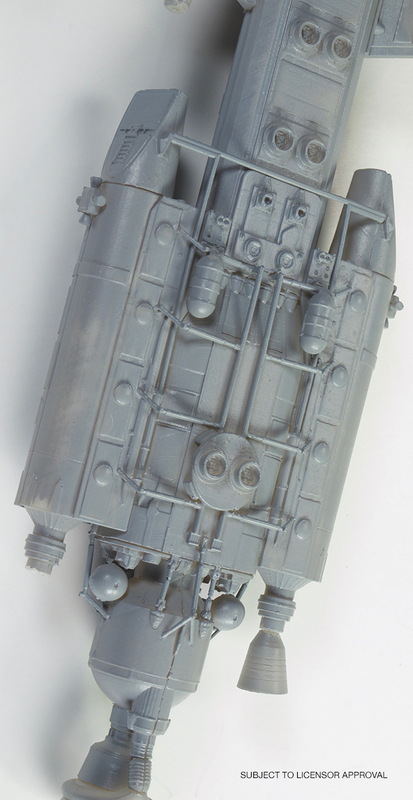 The “damaged” nosecone was detailed only on the side that the camera would see. 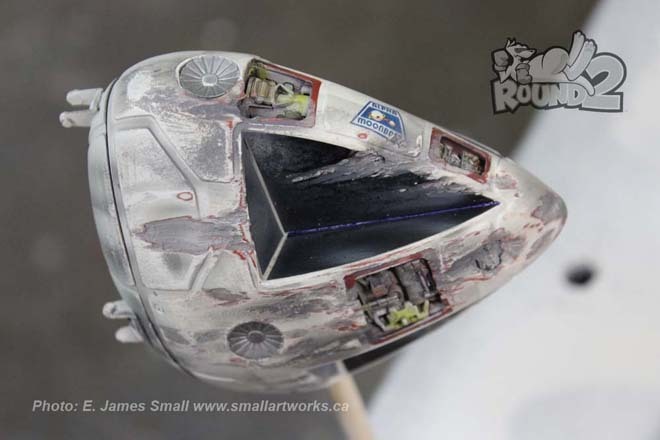 I cut out panels, detailed the voids with kit bashing and made dents on the surface, simulating the damage incurred during a crash landing, using heat from a small blow torch (very gingerly used!) and a Dremel tool. The opposite side, left mostly unfinished, had a plug-in mount installed where the left sensor dish would be so it could be propped up with the supporting rod (simply a wooden dowel) positioned away from the camera. 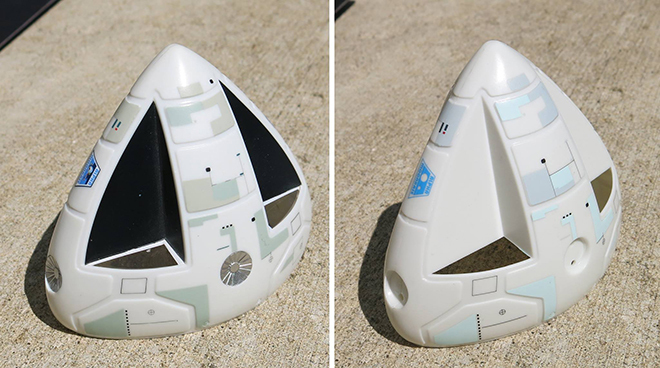 The Eagle nosecone modified with kitbashed parts put into into holes cut out of the kit and painted to resemble crash damage. I also put functioning LEDs into the light stands and the cone beacon to add authenticity. 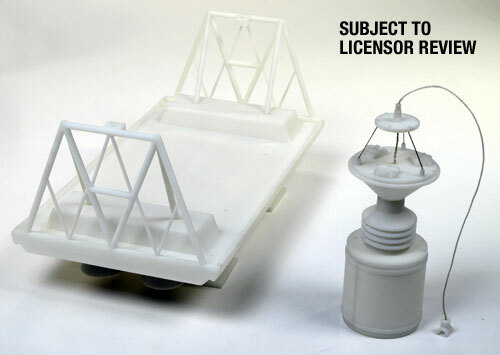 Four light stands were fabricated using sheet styrene and square tubing. These would later be mounted to a base which supplied the power using a 3 volt battery box underneath. Testing the lights on the stands. Three 5mm “Straw Hat” style LED’s were used in each stand. 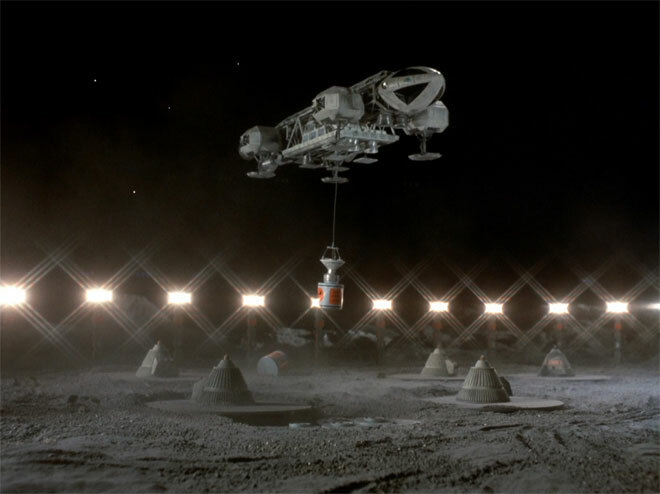 The red areas on the trunk of the light stands were also to appear lit up, but this was a VFX cheat, borrowed from Brian Johnson and his crew when they lit up the main model of Moonbase Alpha’s windows, by using red reflective “Scotchlite” tape applied that would bounce the light back to the camera when it was shone from the camera’s point of view, just the same way road signs are lit with car headlights. All the finished props built for the box art photo shoot. Some of the shots I did were the relatively simple ones, those shot against a black velvet background for the outer space beauty shots of the model shown on the sides of the box cover. Because I knew that the motif of colour that Jamie had designed for dramatic impact was to have a significant red tint, I used a red fill light to enhance the shots. I also shot a couple using green and blue fill light to impart a more colourful tapestry in case he had some other ideas in mind, but Jamie wisely rejected them. 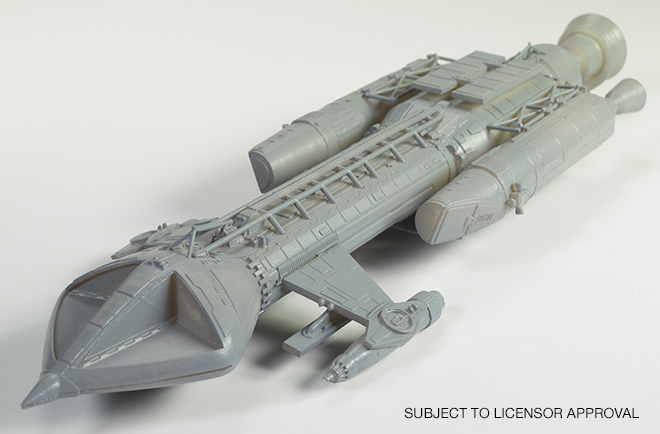 The finished Cargo Eagle model shot against black velvet and fill-lit with a red spotlight for dramatic effect. 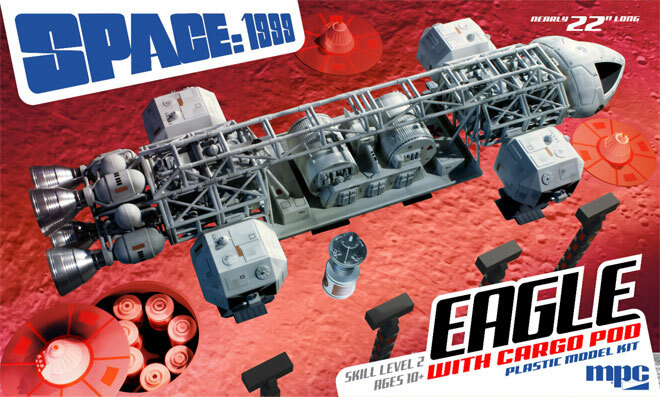 The rectangular landing pad the Eagle is shown sitting on with its flatbed loaded with nuclear waste canisters was made quickly from sheet styrene using screen grabs as a guide for proportion and detailing to scale with the 22” kit. 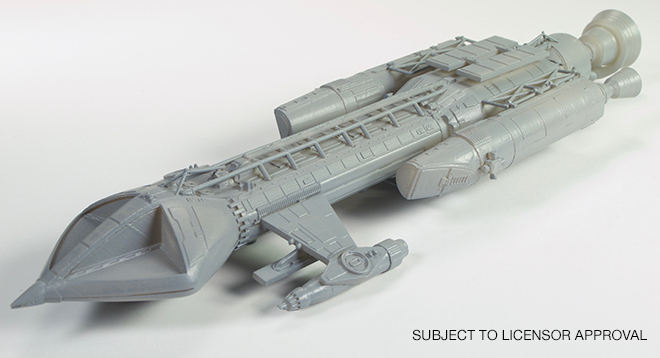 Coincidentally, the actual VFX shot for the episode used the like-scaled studio model 22” Eagle! 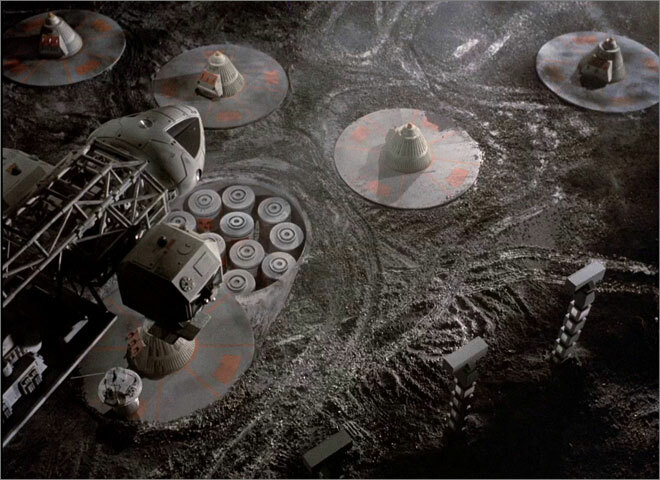 Lunar regolith was simply made from sprinkled concrete powder on the 3 foot square work surface. The waste cone was repositioned for different exposures and assembled in Photoshop to make it look as if there were several of them in the scene. Since a true “multiple exposure” is impossible with a digital camera (I currently use a Canon Rebel T3i), this compositing technique was necessary. 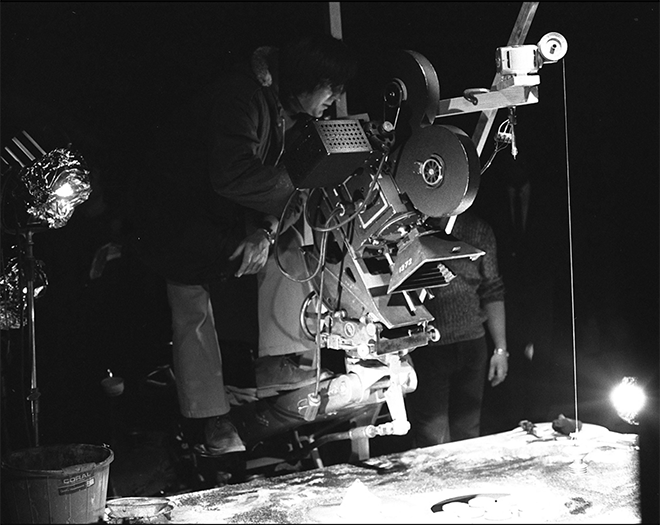 The same thing was done with the four light stands to make it appear that there were more of them in the scene. 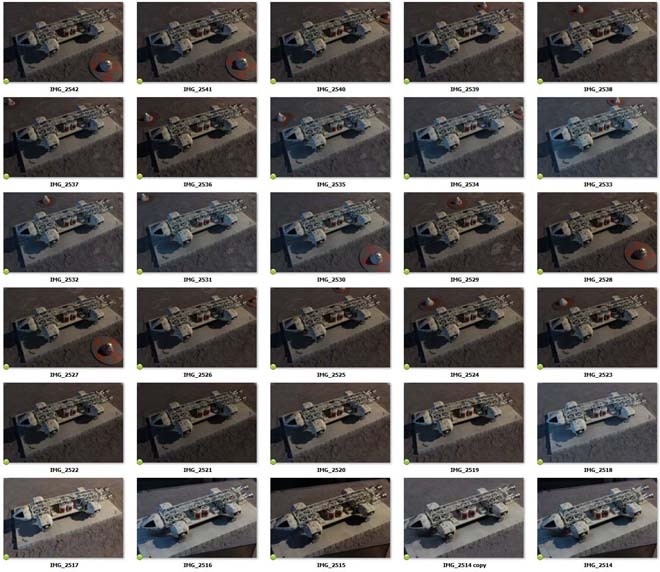 All the shots taken for the Eagle sitting on the pad with the waste cones surrounding it. 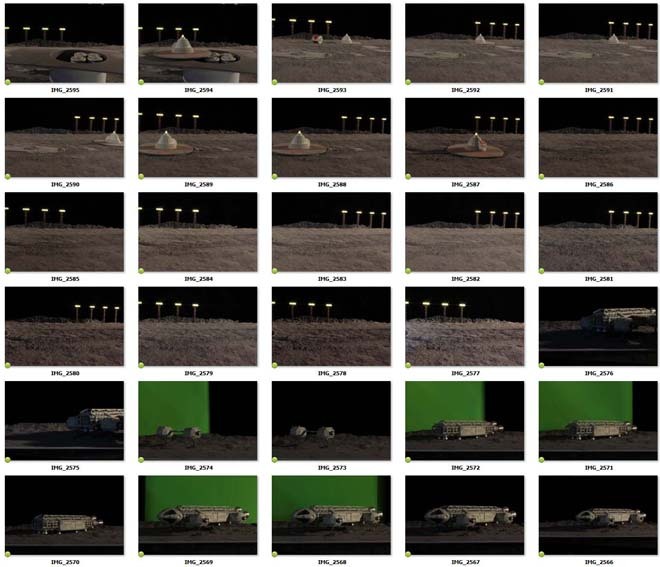 Several shots were done identical except for lighting effects and the waste cone prop repositioned for each shot so that when composited, it will look like many cones surround the model using the single prop. Not all the pictures were used in the final comp, of course, but I took a lot of extra shots to provide different options. The models were all photographed with the camera mounted to a tripod and suitably lit. Time exposures had to be used to achieve maximum depth of field. 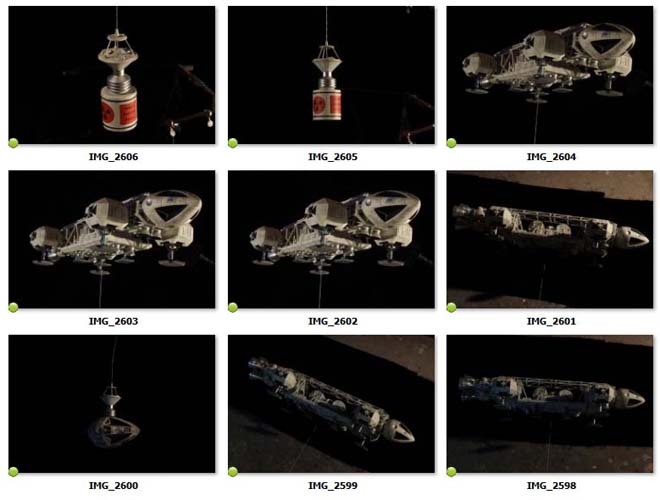 The hanging “damaged” nosecone and waste canisters were solid mounted and shot separately to be matted in later, as just the slightest movement during exposure with them hanging off the Eagle would have blurred them in the picture. 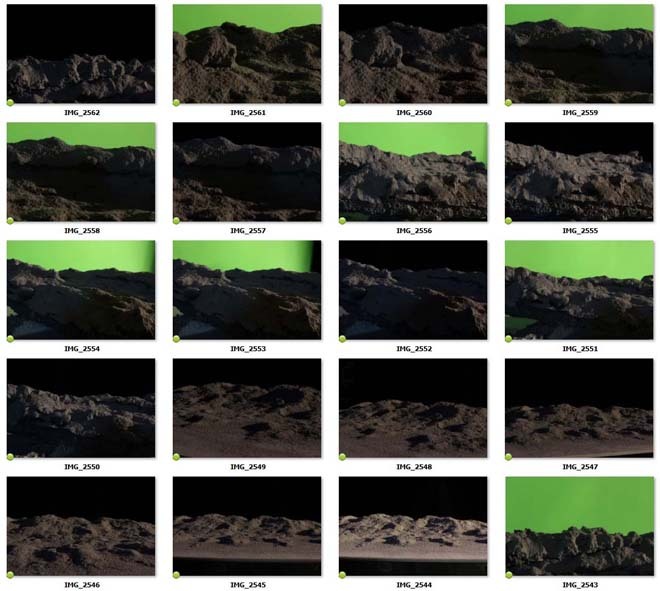 In some of the examples of the raw pictures shown you can that see some of the elements were shot against a green screen thinking this would be helpful in isolating them for compositing, but in reality this caused more problems than it solved due to fringing and “green spill”, so that idea was abandoned and I just used the ones shot against black velvet instead. 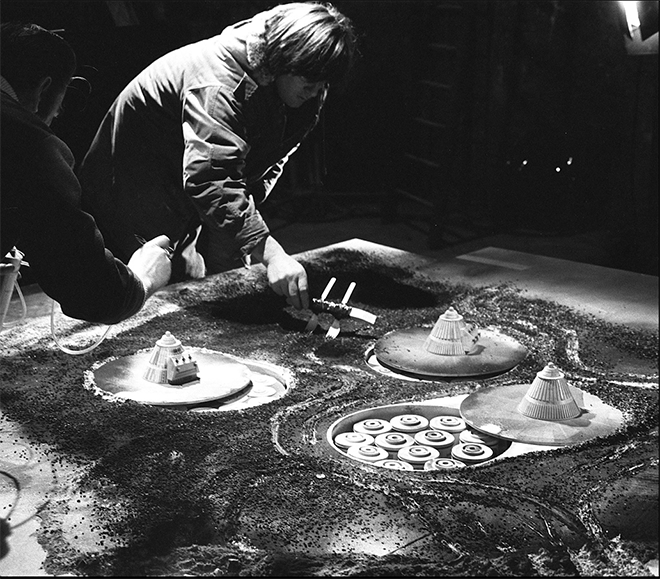 Some of the elements shot separately which would later be combined into the finished VFX pictures. Not all shown were used, some were used that are not seen here. Some colour correction and sweetening would also be employed to maximize the look of the finished composites. Two of the scenes also required mountains for the background and foreground hills. Because of the limited space on the table I actually made the distant mountains from small pieces of carved foam, sprayed with gray primer which further textured them and sprinkled with concrete dust. These mountains in reality were just about 6 inches wide or so, but shot in extreme closeup and lit harshly. They were simply matted in behind the models. 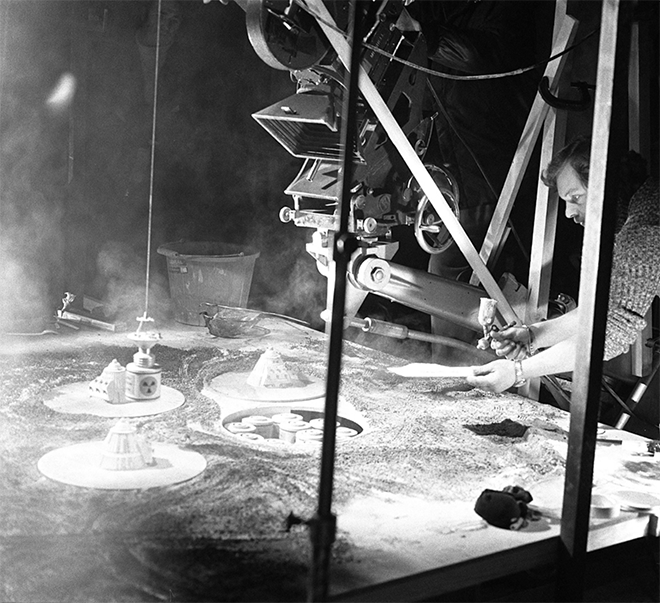 A similar technique was also used by Johnson’s VFX crew for distant mountain ranges, but without the aid of digital compositing! 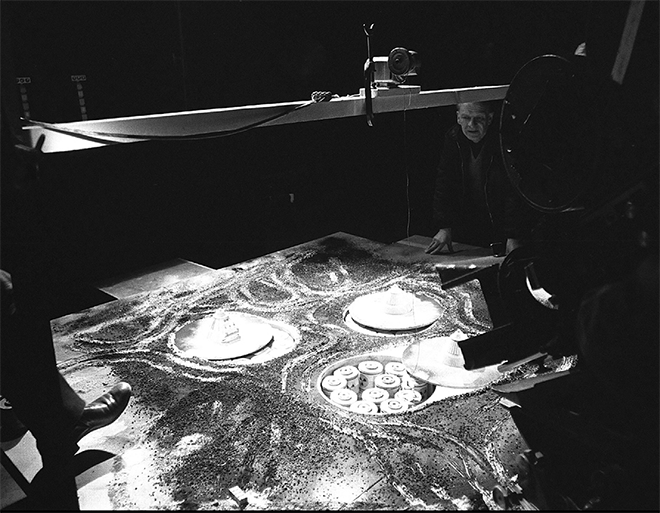 Instead, they had the miniature mountain photographs blown up and mounted to large wooden flats, propped up behind their model sets. I had considered doing the same thing, but it was far less expensive for me to plop them in using Photoshop. In addition to these VFX shots I also took a series of photographs that were designed to help Jamie compose his painting, but he will cover those in his own article shortly, and are therefore not presented here. I also shot several “orthographic” pictures of the finished model for the box tray sides to show decal placement and paint schemes for the consumer to use as reference. 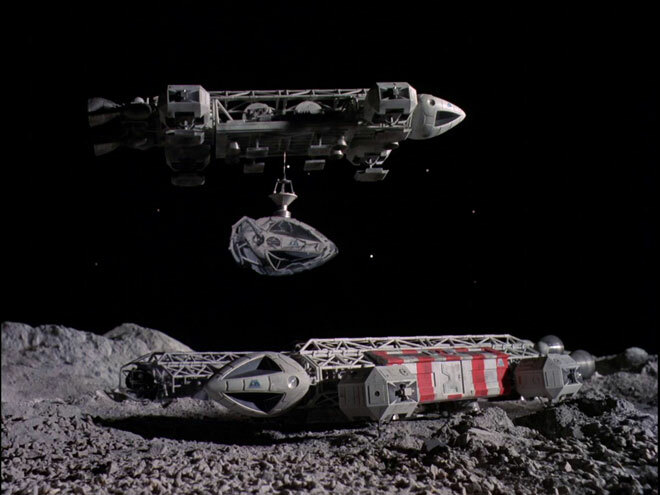 The miniature was propped up in front of a black velvet backdrop, suitably lit and shot with a 300mm telephoto lens from about 25 feet away to help eliminate perspective distortion, making the picture plane look as close to a blueprint-like image as possible. The three finished composites using the previously photographed elements. You will find these images gracing the box tray. Compare to the inspirational screen caps from the show. 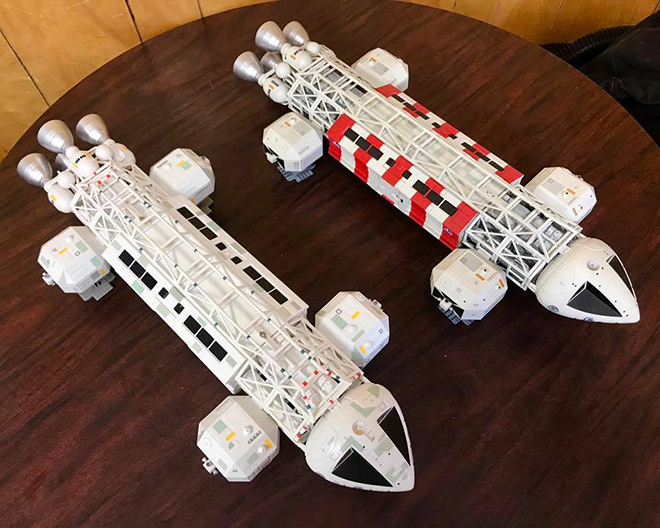 I always have a lot of fun building models, but just as fun is when I have the opportunity to recreate the spectacular scenes that remind us why we loved a TV show like Space: 1999 in the first place. 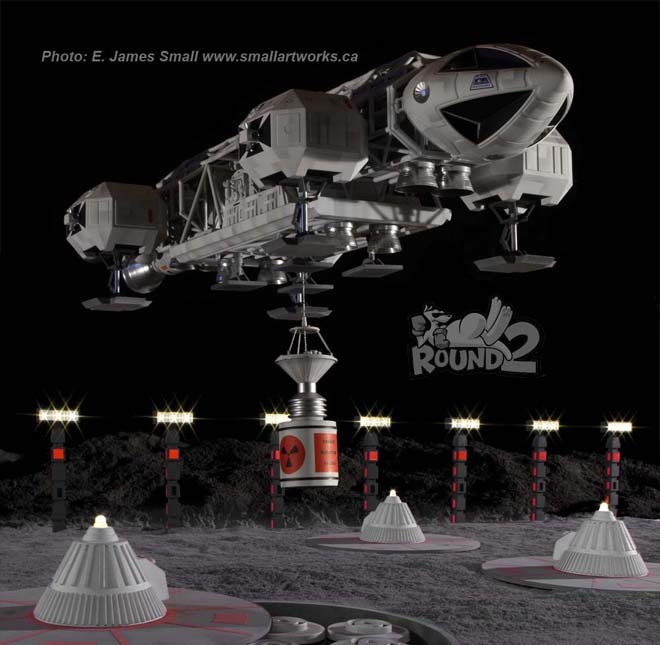 Special thanks to Jamie Hood and all the wonderful people at Round 2 for finding a place for my work to be included as a part of the box art that will soon be on hobby store shelves for everyone to enjoy, containing yet another fantastic kit. Dreams are continuing to come true, thanks to Round 2! 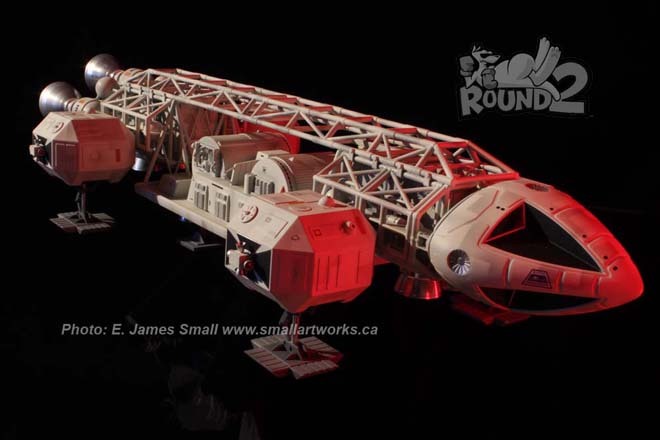 If you want to learn more about model photography, be sure to check out the article Jim wrote on the Central Nova Scotia Modelers web page here. 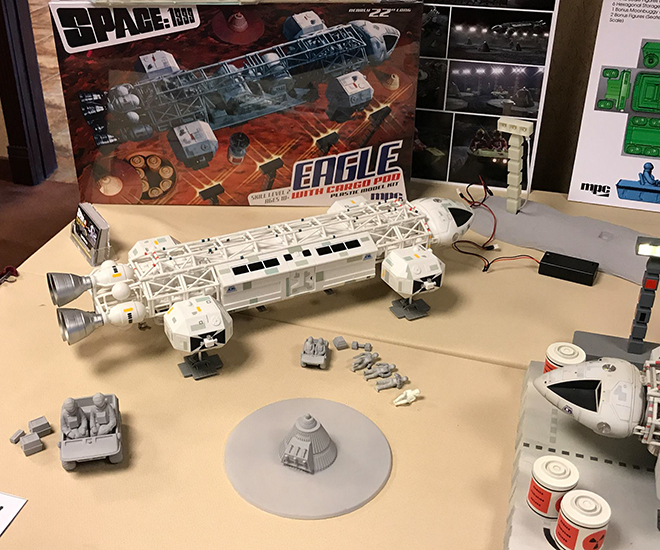 Since our 22″ Space:1999 Eagle hit the market, modelers have been clamoring for more and continue to ask what is coming next. 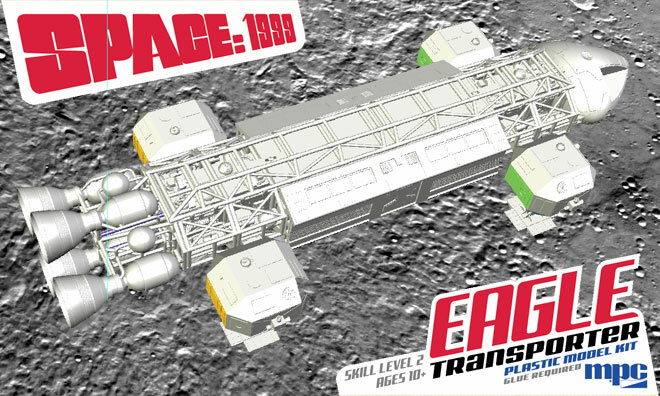 Here is our official announcement that the next Space:1999 kit will be a 22″ Eagle with Cargo Pod! I don’t have much time at the moment, so I’ll dive right into the details as we know them right now. 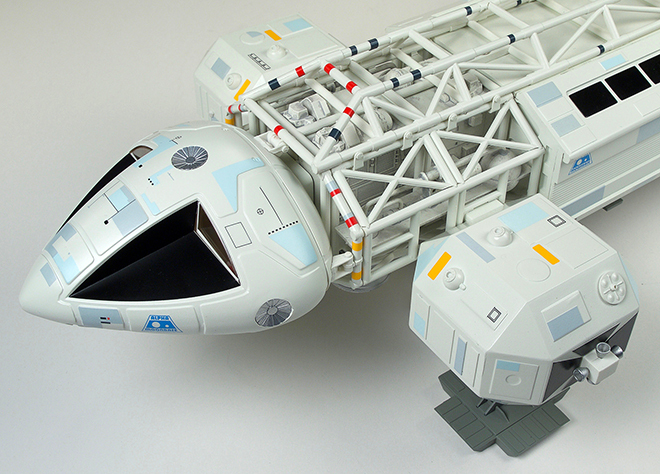 Of course it includes the flatbed “cargo” pod, but comes with a couple options. It will come with a full winch assembly along with the magnetic hoist. Yes, magnets will be included. 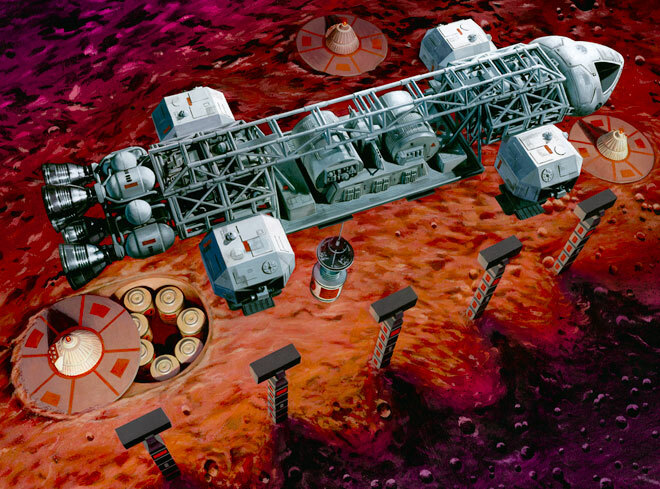 The kit will also come with four nuclear waste canisters. You can rig one up to work with the magnetic hoist or use all four to fill the flatbed. The kit will be a full Eagle kit. 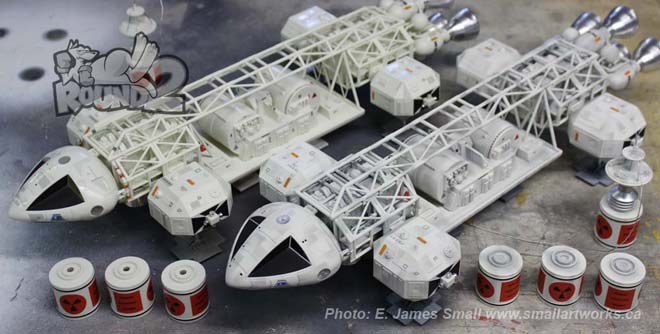 We will be swapping out tooling inserts that replace the tools that injected the passenger pod parts for tools that will inject cargo pod parts. 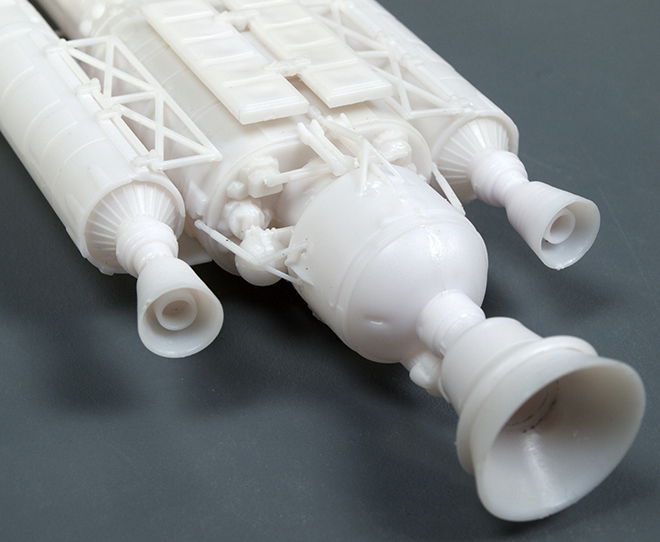 I say this to be clear that it will not be possible to produce separate pod kits for our 22″ Eagle. 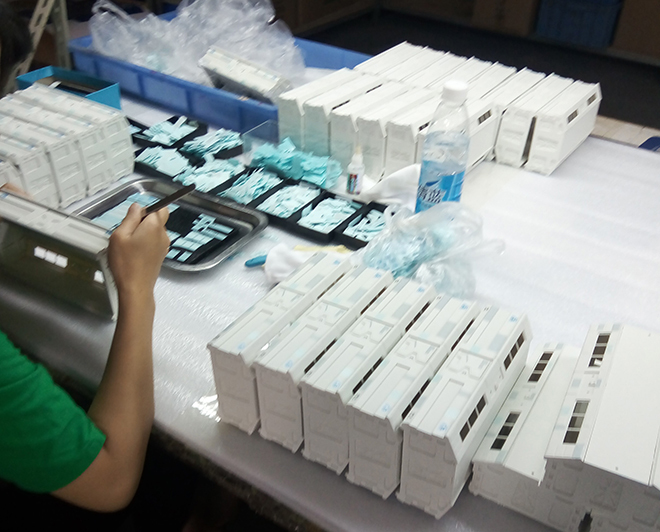 Doing it this way keeps both the tooling investment and production costs lower in order to deliver the kit at the lowest price possible. We haven’t announced the pricing or release date yet. 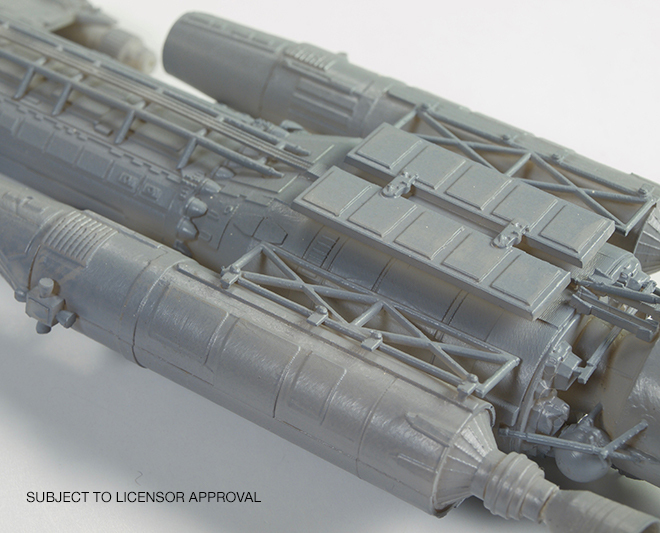 Due to using one sprue of new parts and including things like the magnets, expect it to be a bit more expensive than the standard 22″ Eagle. It will probably be available in mid-summer. 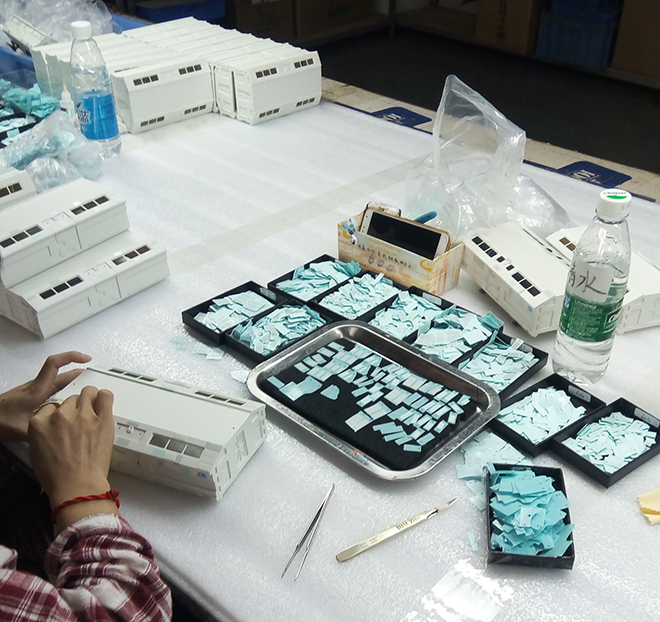 The development of the new parts so far has proceeded at a brisk pace, and we will be tooling the parts soon. Expect to see our buildup at Wonderfest in May, 2017. 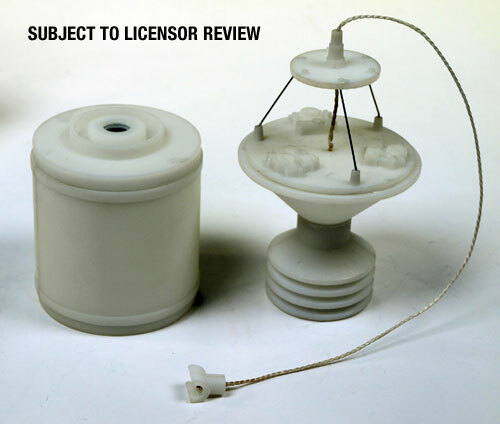 While I’m mentioning Wonderfest, let me remind everyone that we offer a substantial award in the model contest for the best use of a Round 2 kit. We give prizes to both the adult category and the best to come out of the junior & teen groups. 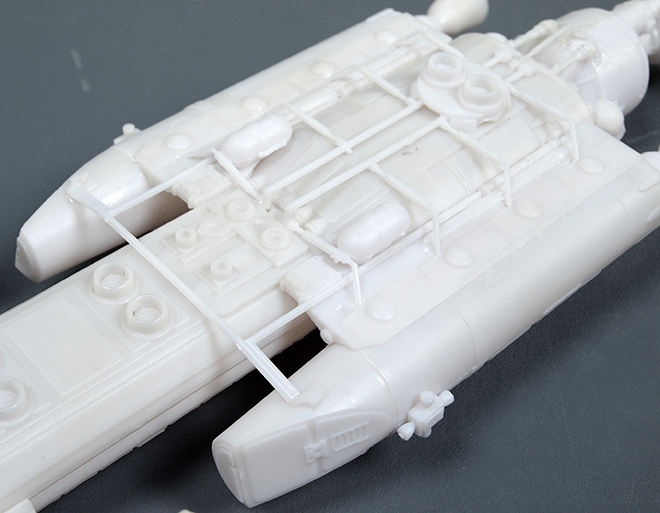 Historically, we like to see either pristine builds using one of our kits OR the significant use of one of our kits in a creative new design or kit bash. They hope to set a new record of 700 entries this year. Sounds like an amazing opportunity! 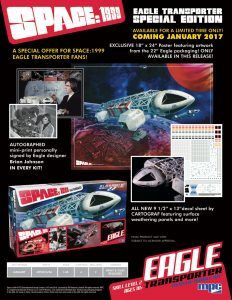 I also wanted to mention that due to an unexpected delay with the Special Edition Eagle that spotlights Brian Johnson, we are not certain at this point if the kits will ship before the end of the year. There is a chance, but it is slim. If it doesn’t release by the end of the year, it shouldn’t be much further than a week or two into January. 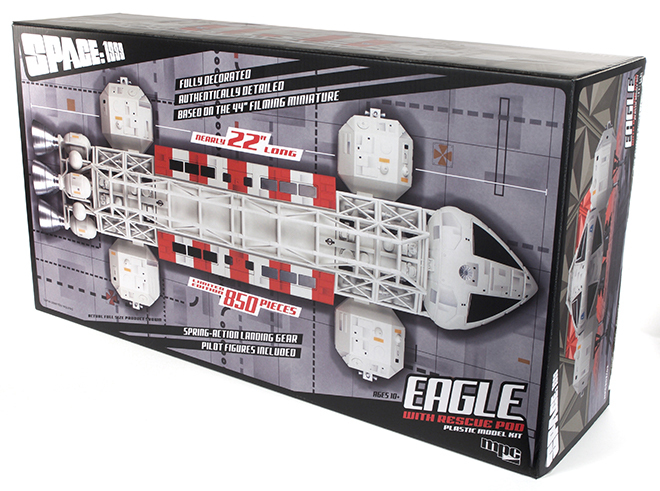 Anyway, on with the pics of the Cargo Pod Eagle! Okay, guys. Time to let a cat out of the bag. 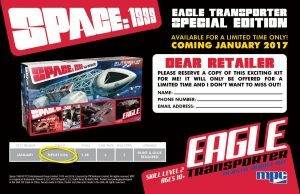 We will be offering a special edition of the 22″ Eagle. 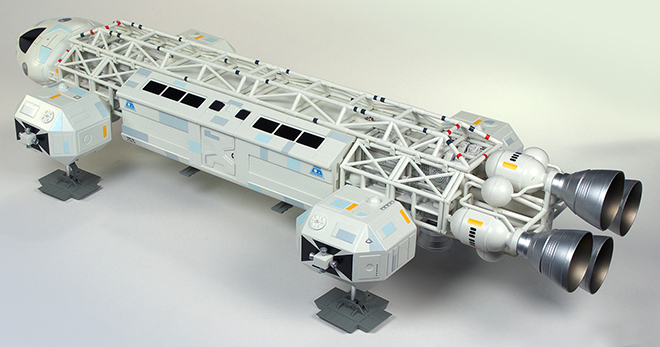 This release gets a few very special extra goodies thrown in for the Space:1999 aficionados out there. 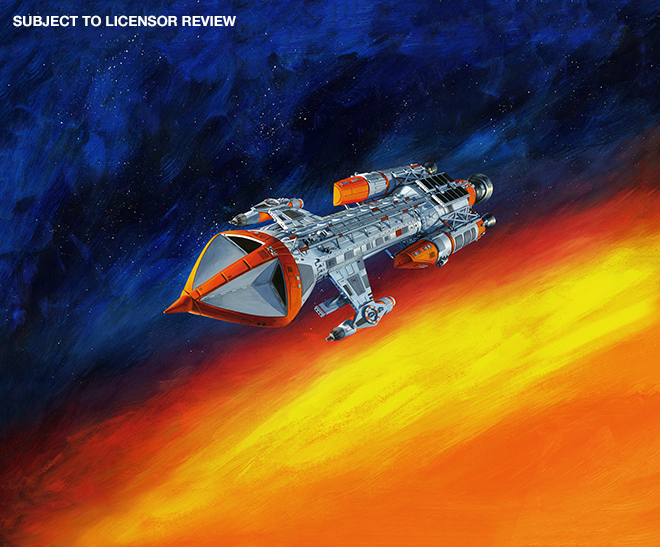 It starts off with an 18″ x 24″ poster featuring the box art from the kit. Logos have been minimized to really show off the great art on its own. We have gotten several requests to offer this poster. So here is your chance. 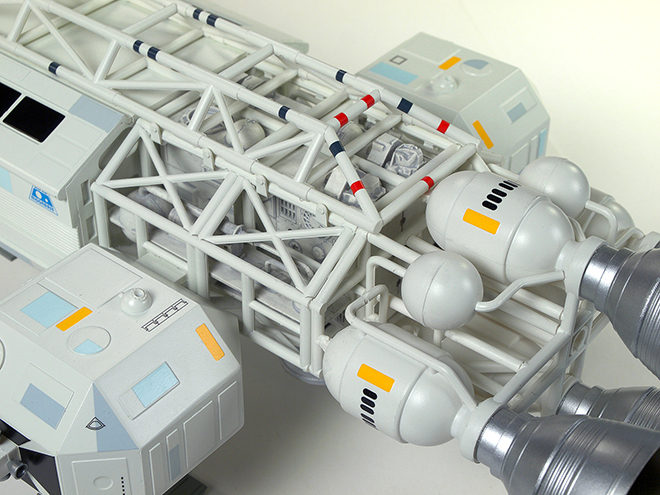 Next, we are adding a big sheet of additional decals that feature some specific paneling arrangements that were shown on the filming miniature. 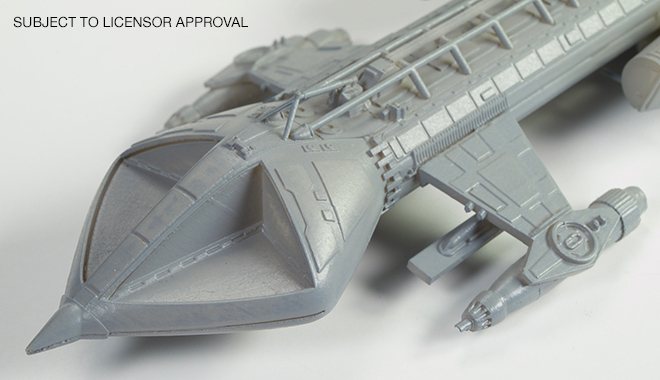 It comes with additional marking and “weathering” to randomly spread across the model. This allows the builder to use no paint, or just use a base coat, then apply all these new decals to achieve a great look without additional masking and painting. 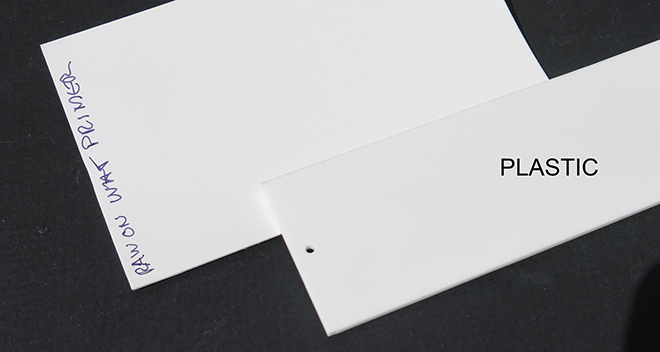 This special sheet is has been produced by Cartograf of Italy, known world-wide for their outstanding quality. Last, and best of all, this edition comes with a signature card signed by the Eagle Transporter’s designer Brian Johnson! This is not a blind draw, “chance” offering. Every kit will come with an authentic hand-signed card. 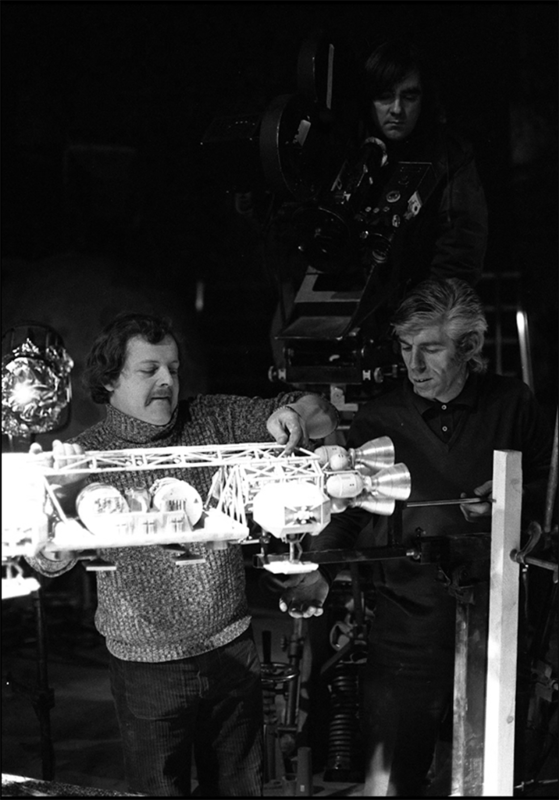 Brian is a BAFTA and Academy Award winning special effects wizard with credits on films like 2001: A Space Odyssey, ALIEN, ALIENS and The Empire Strikes Back, not to mention his contributions to other Gerry Anderson productions such as Thunderbirds. This is a truly unique opportunity! 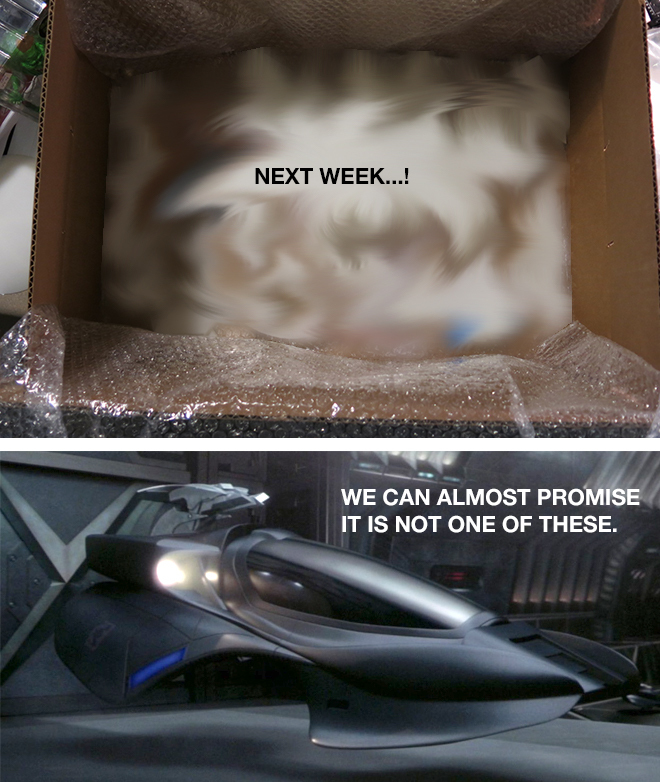 If things go well, (and they are so far) the kit will be available before Christmas. We suggest it should retail for about $200, but you will need to check with your usual retailer. The kit will be available for a limited time and in limited number. Right now, we are looking at an edition of 500 copies, but if we get an overwhelming response, we may do more. When they are gone, they are gone. I’m sure many will wonder if we will ever sell the add-ons separately. The answer is that we may offer the decal sheet later on, but not for a while and definitely not until we have sold out of this edition. Click on this preview to see all the details. Then, either click and print this form and fill in the info for your usual hobby dealer. Or download a PDF here. Fill in the form fields and email it to your dealer to reserve your copy.